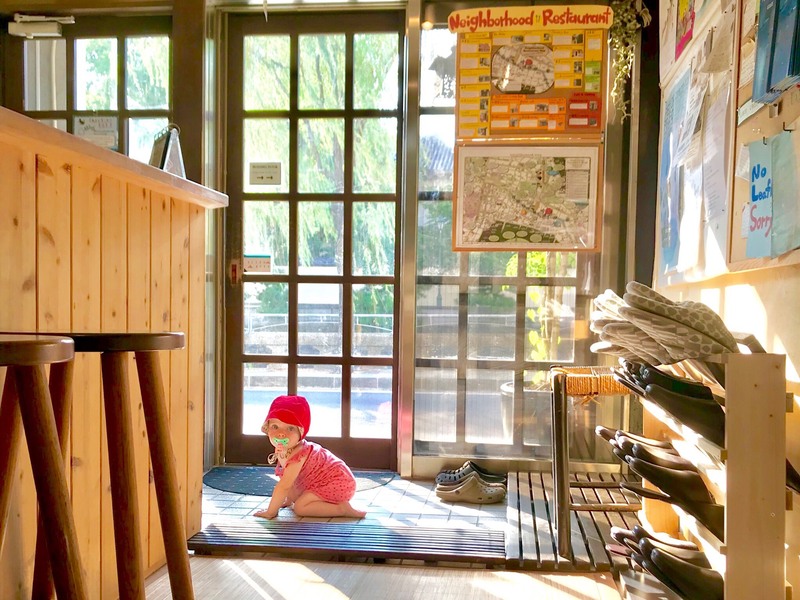 It’s been very very hot throughout in Japan. It’s very hot in Nagasaki too. 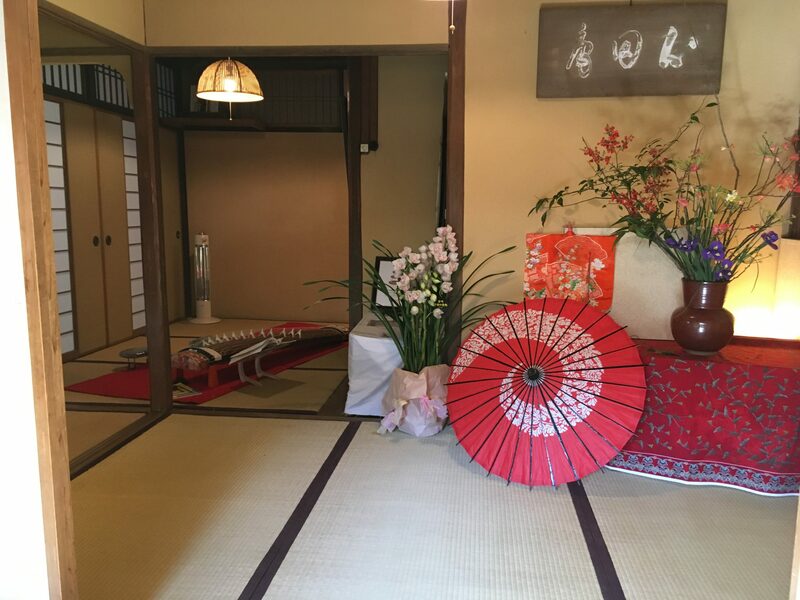 Many things went on in AKARI in August and we have welcomed many guests. 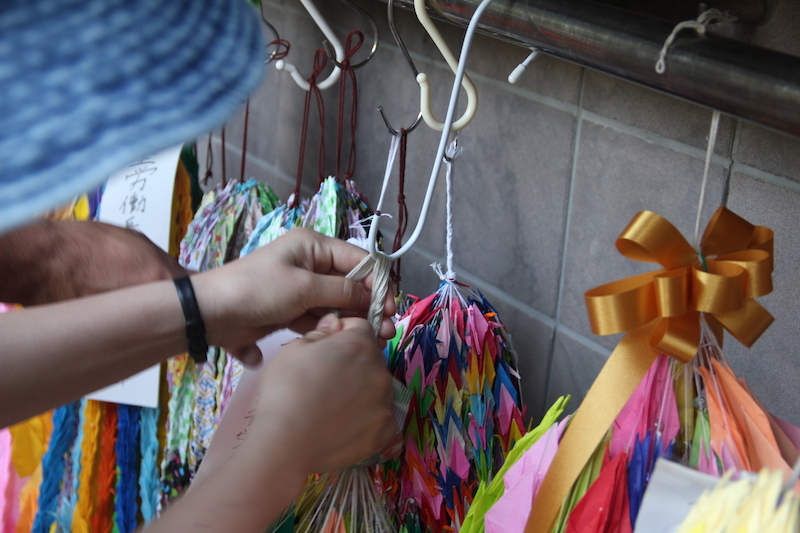 On August 9th, we brought thousands of paper cranes to hypocenter. And we donate them while wishing for peace. 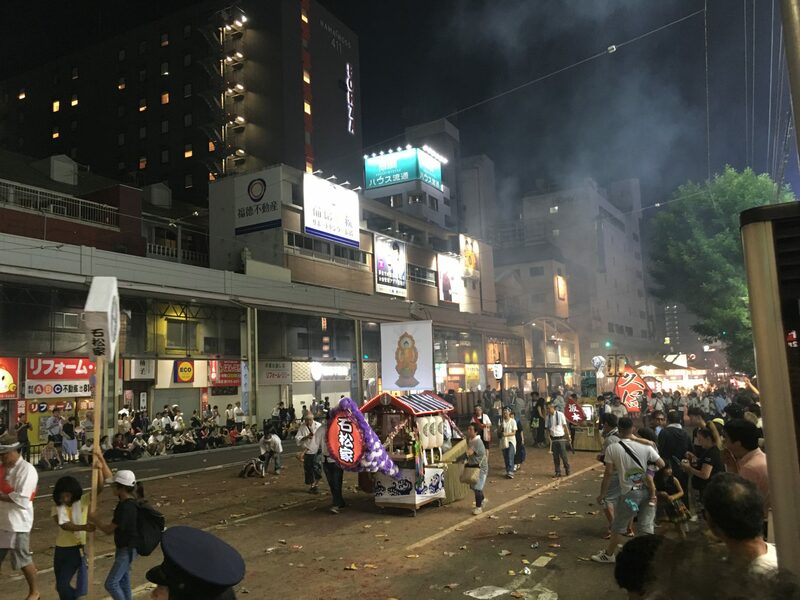 On 15th of August, Syorou Nagashi, 精霊流し, was held. It’s an annual event based on buddhism. They make a ship for their relative who passed away this year or last year. 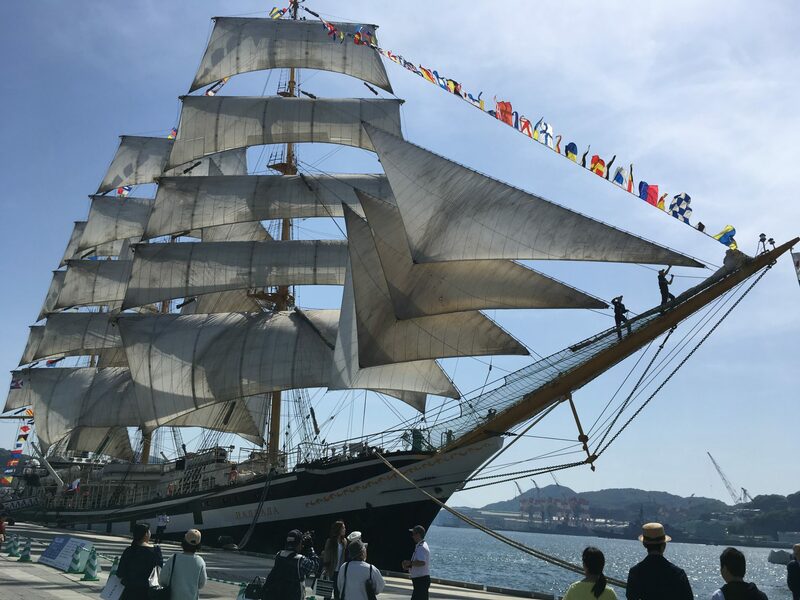 Ship is said to go to heaven on 15th of August at once. Ships are decorated with many things that loved one used to like. 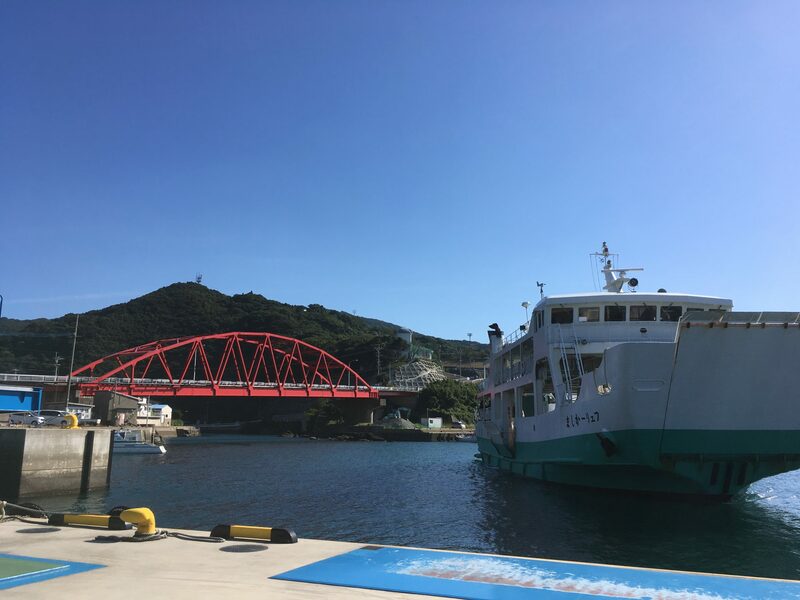 They carry the ships to Nagasaki port. On the way to the port, they make fire on firecracker because noisy sounds let the souls stay away from bad things. This guest had a happy birthday in August. 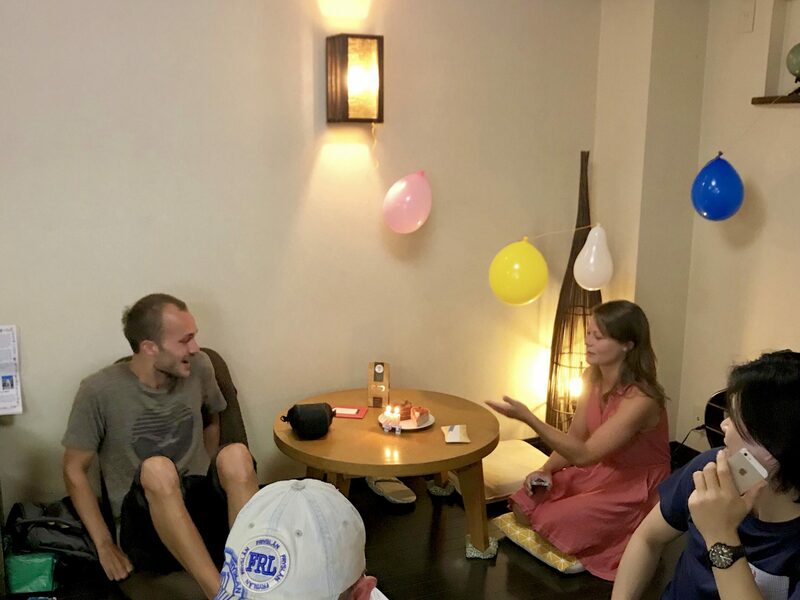 We celebrated his birthday with other guests bu singing happy birthday. She made a surprise for him by decorating balloons and cake. It was a happy moment. 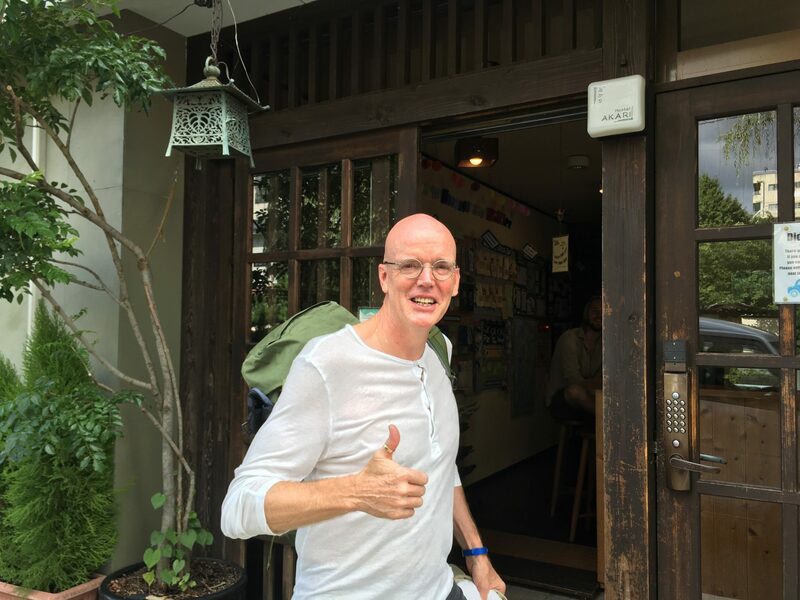 He is a guest from Netherlands. He was such a kind guy because he brought us coffee or some snacks almost every morning. Thank you so much for your kindness. 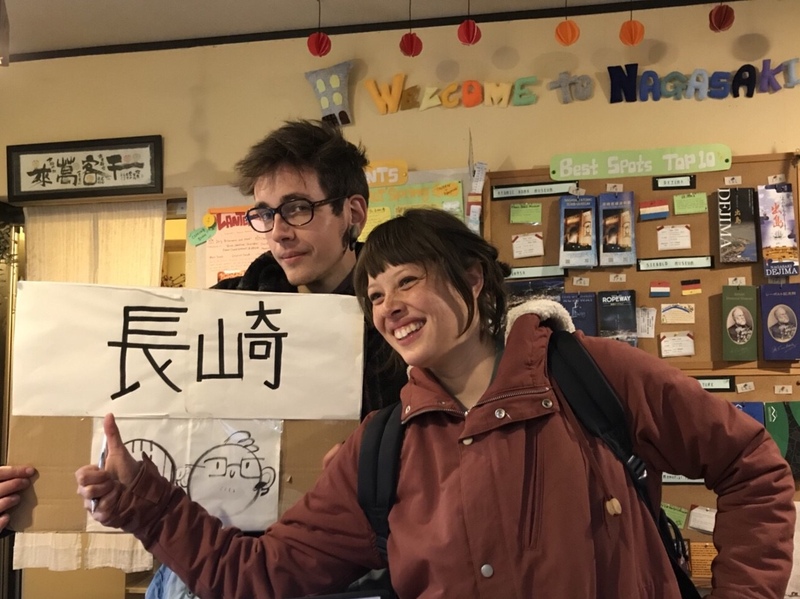 They are cute guests from also Netherlands! It’s been very hot, but guests like them ease the hotness. From tomorrow, it’s going to be September. We hope the sun will be tired..
9th of August was Nagasaki Peace Day. 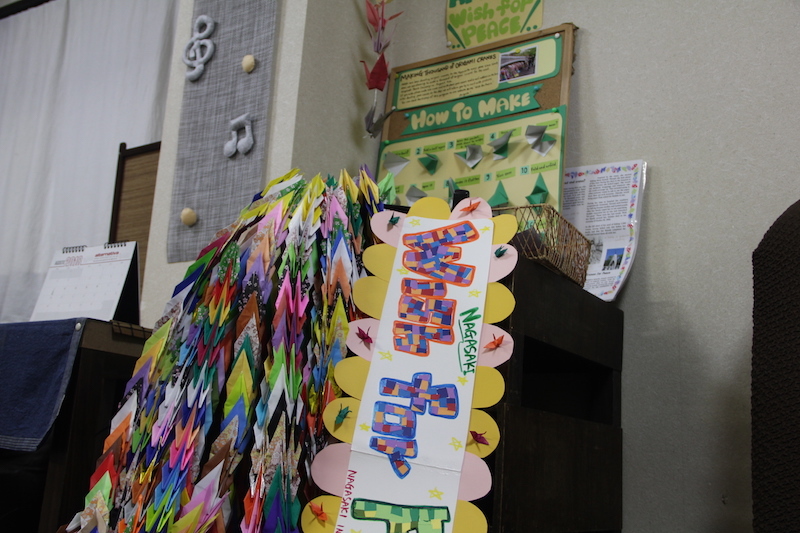 In the morning of the 9th August this year, which was few days ago, we went to the atomic bomb hypocenter and donated thousands of paper cranes folded by our guests who visited AKARI. 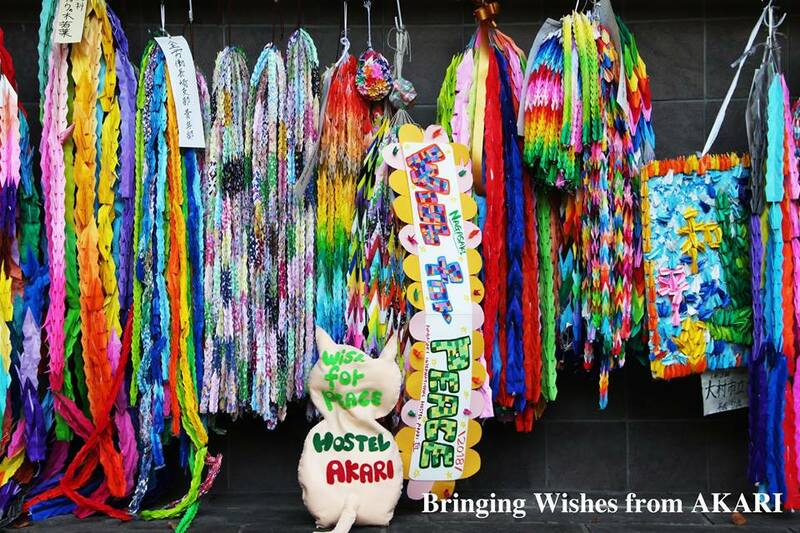 We wish for peace through this project. Nagasaki city is having a rainy season right now. Everyday is rainy and cloudy, but these hydrangea flowers bring you a smile. 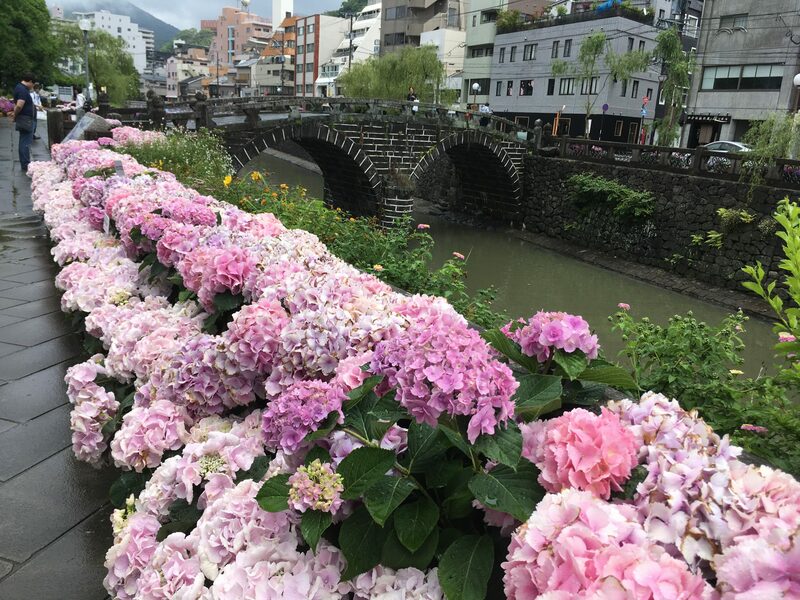 You can see these beautiful flowers along the river side, it’s also neighborhood of the hostel. 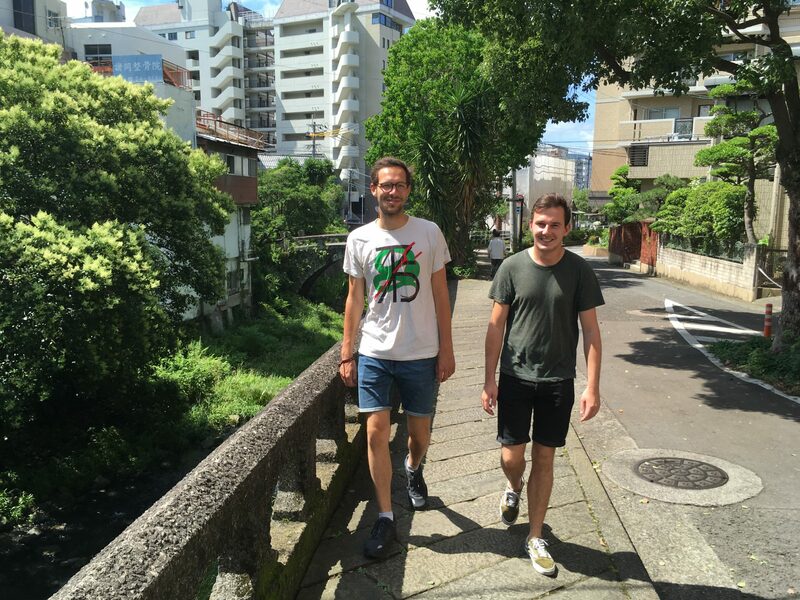 It was a sunny day a few days ago, so we decided to take a walk with our guests. These guests are from Netherland. We talked about lot of things like music, art, Japanese culture and so on. 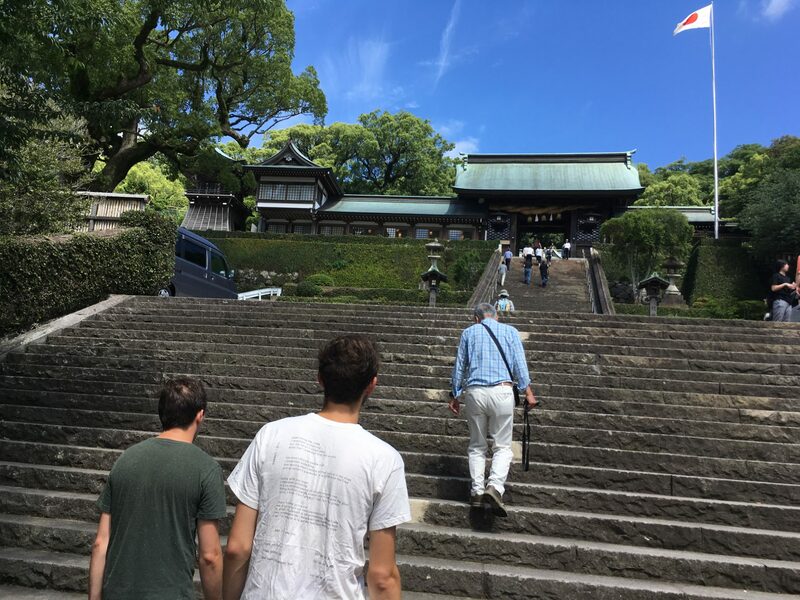 We came to the main shrine of Nagasaki called „Suwa Shrine“. It’s about 10minute-walk from the hostel. 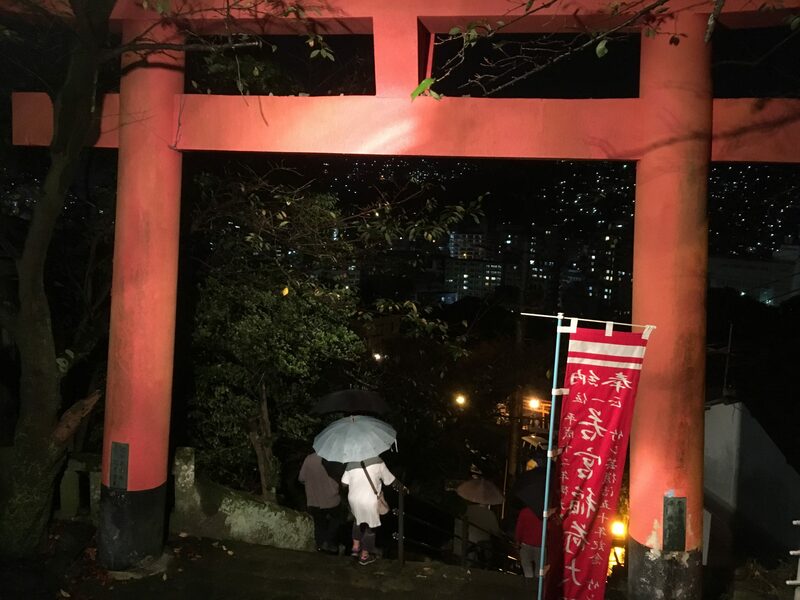 We luckily saw Japanese wedding ceremony at the shrine. 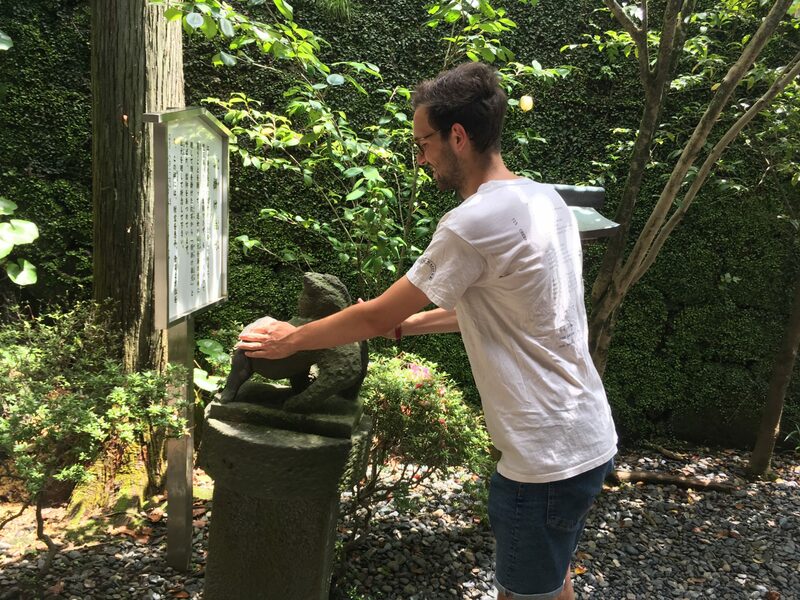 This shrine has small guardian dogs with interesting gimmicks. This dog make your dream or wishes come true if you roll the dog like this. 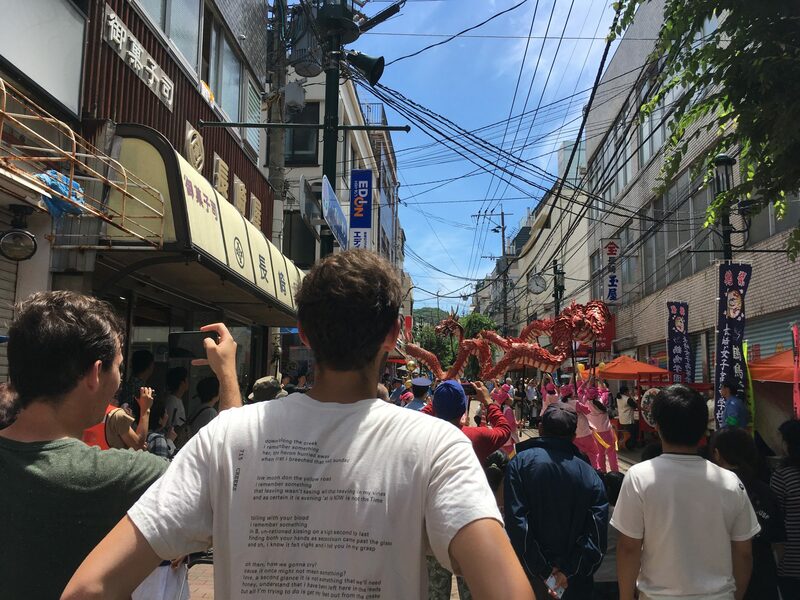 After the shrine, we went to a local market. 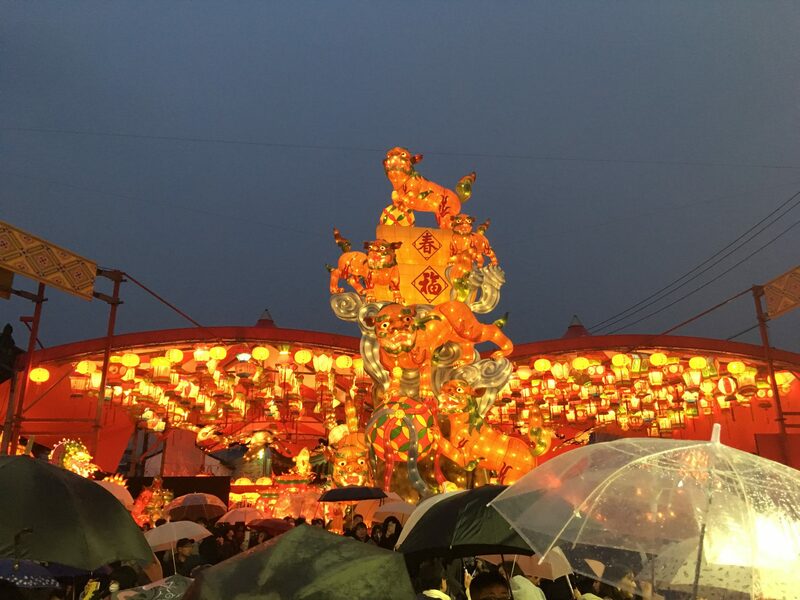 We saw a dragon dance which is one of main performances in the festival „Kunchi“ that takes place in October at Suwa Shrine. 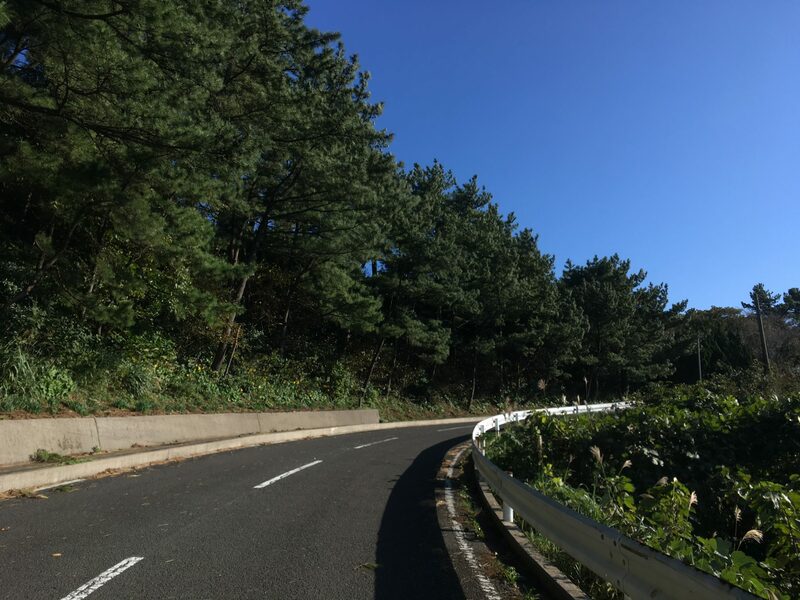 It was a nice walk! All we have to do is waiting for Summer while watching beautiful hydrangea flowers. 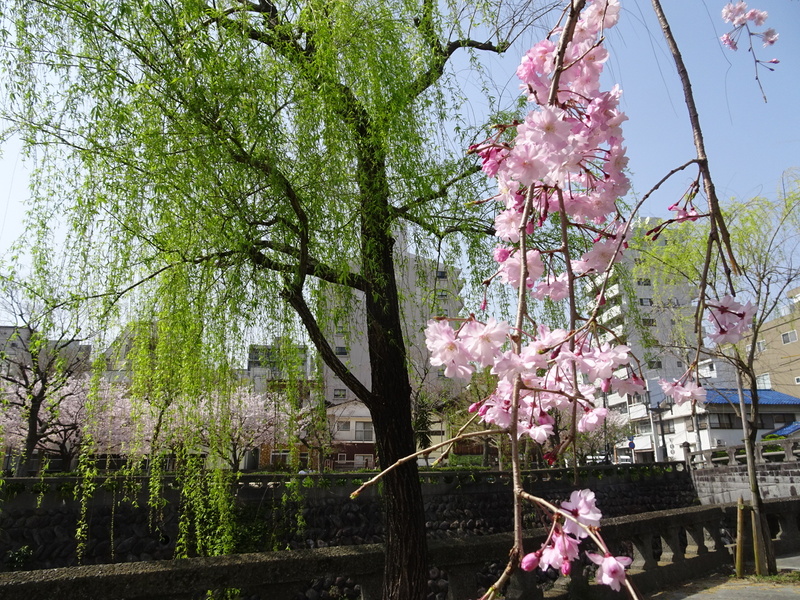 Lantern festival had closed, and Spring has just arrived in Nagasaki. It’s been sunny the last few days and it feels so good. 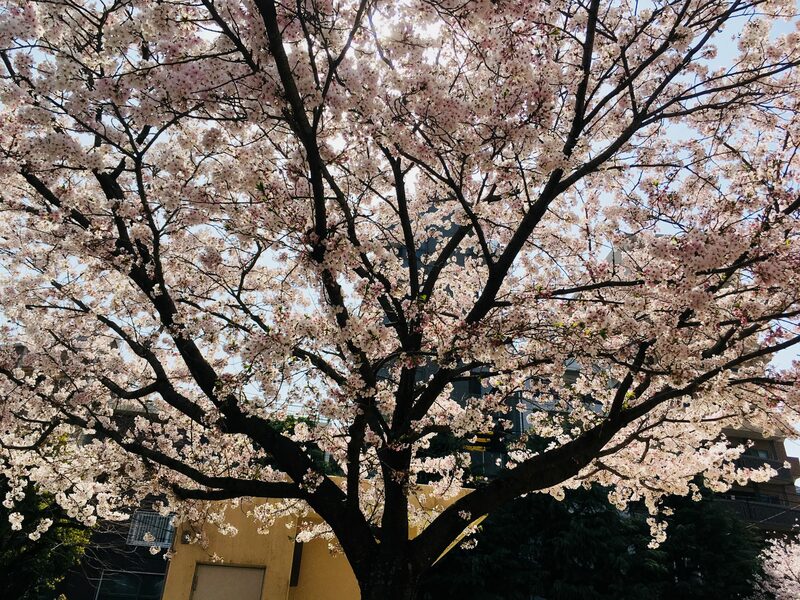 We are enjoying such beautiful cherry blossom flowers. 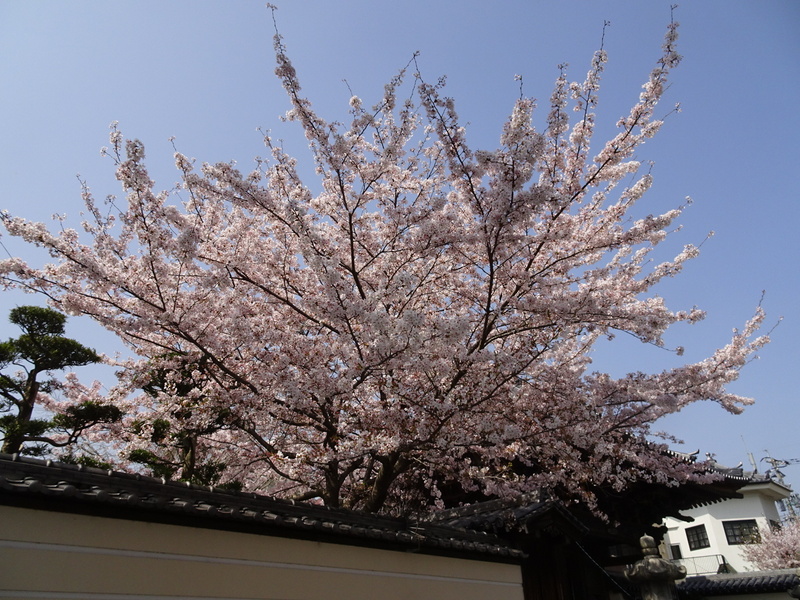 We took a walk at neighbor of the hostel and took photos of Sakura. This temple is located just across the hostel. It’s a park near the hostel. 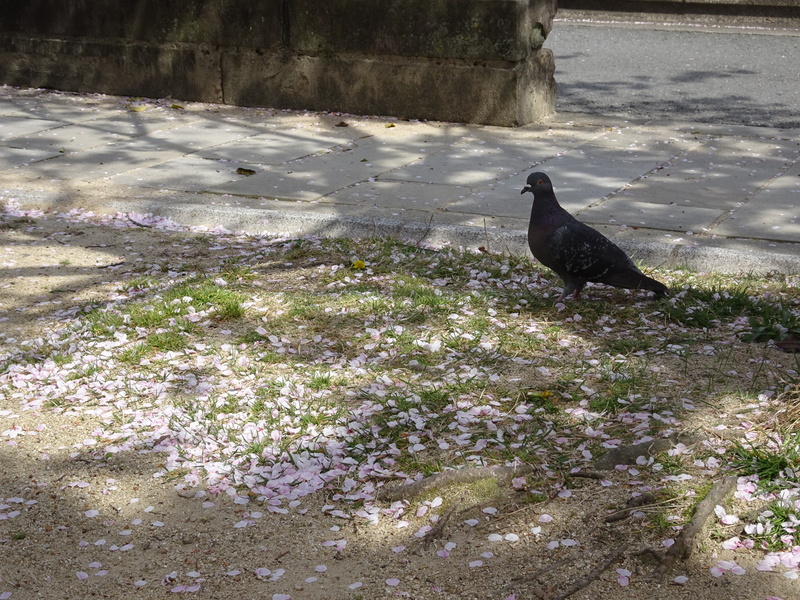 The pigeon was enjoying „Hanami“, Japanese word for flower-watching. It’s along the river side. 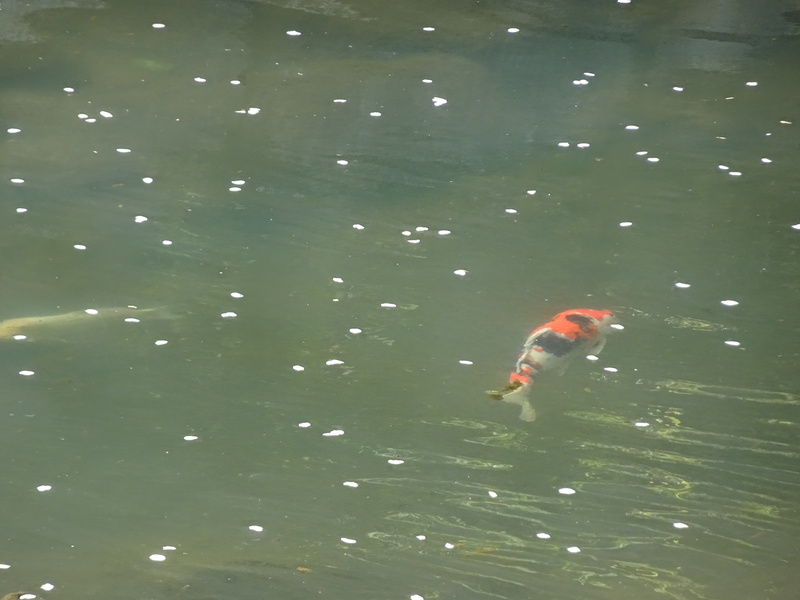 Petals of cherry blossom were running on the river where the carp was living. 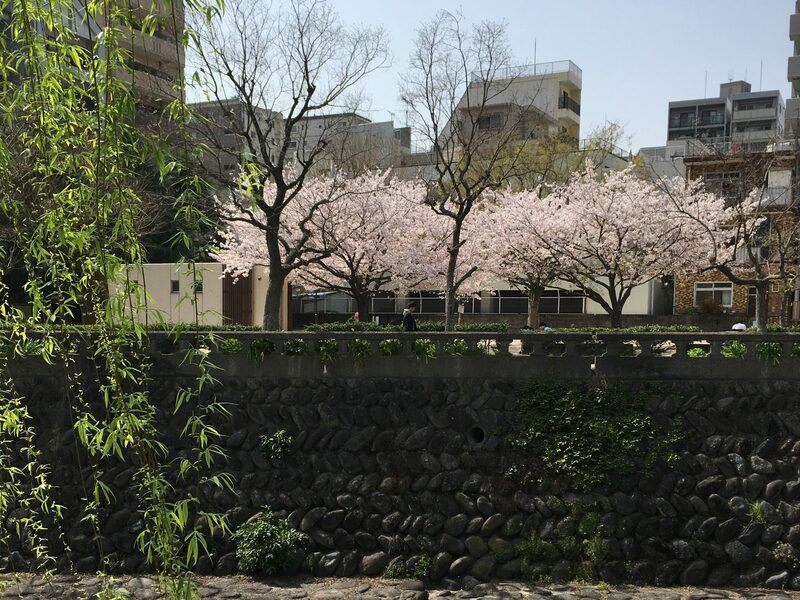 It feels so good to see full bloomed cherry blossom. 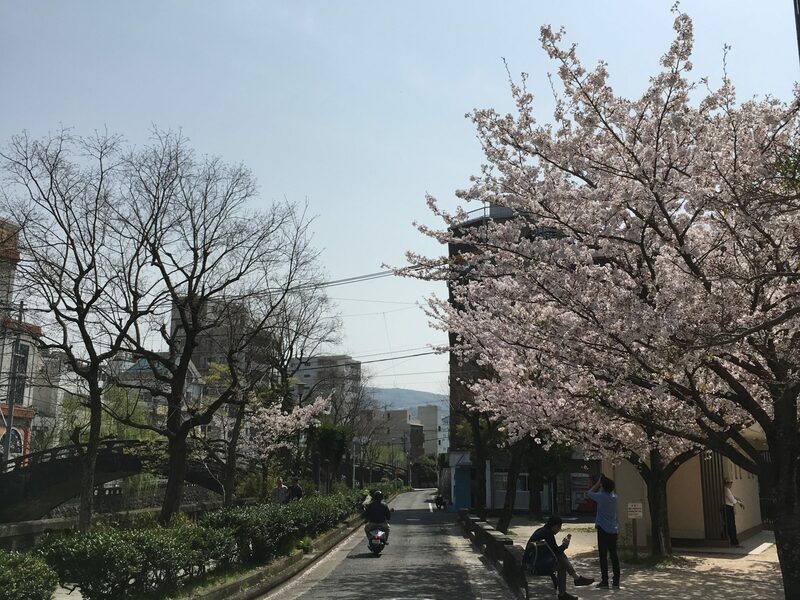 Why don’t you come to Nagasaki and see Sakura in Spring. 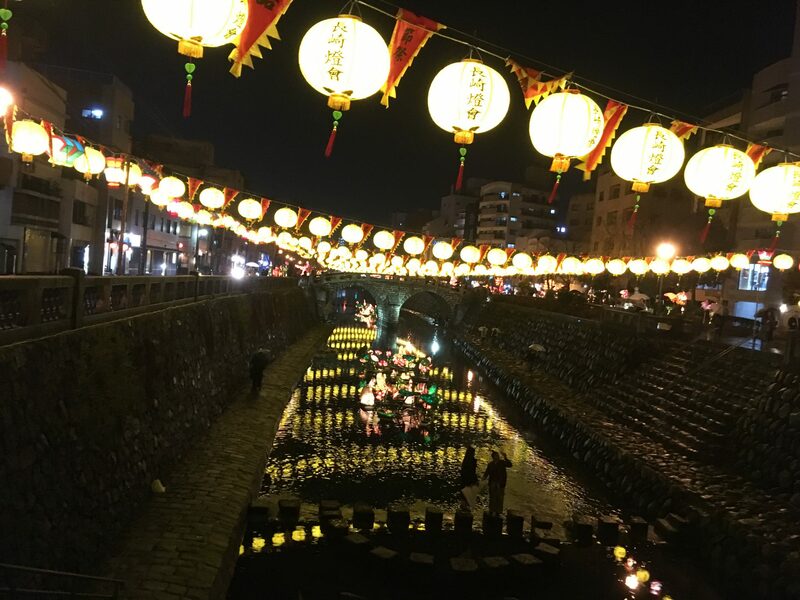 We are having one of the biggest festival in Nagasaki called „Lantern Festival“. 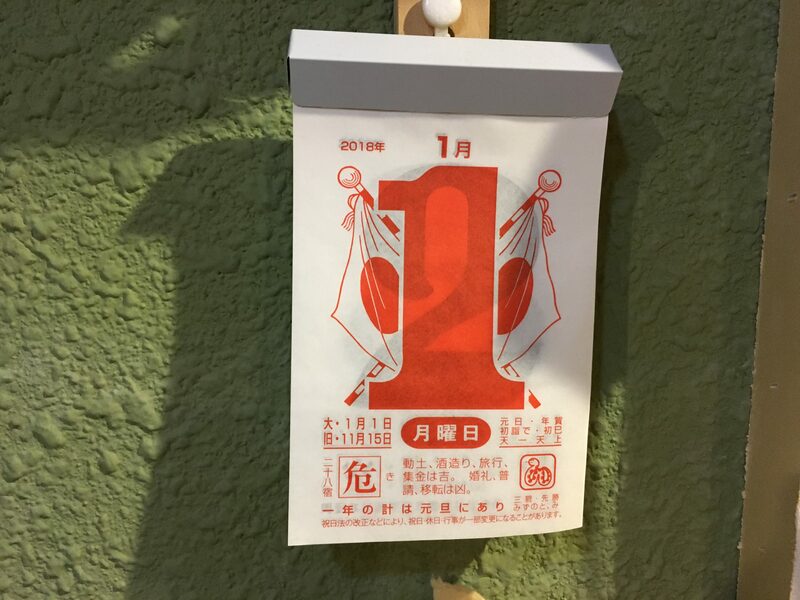 It’s held based on Chinese New Year. 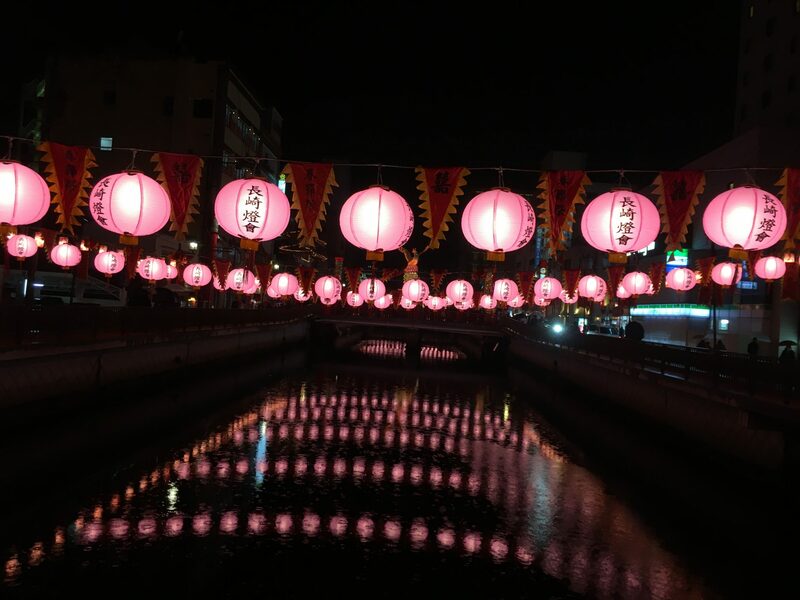 All the city area is covered with beautiful lanterns, so it’s very beautiful. This one is shot in China town. This one is shot in Minato park. 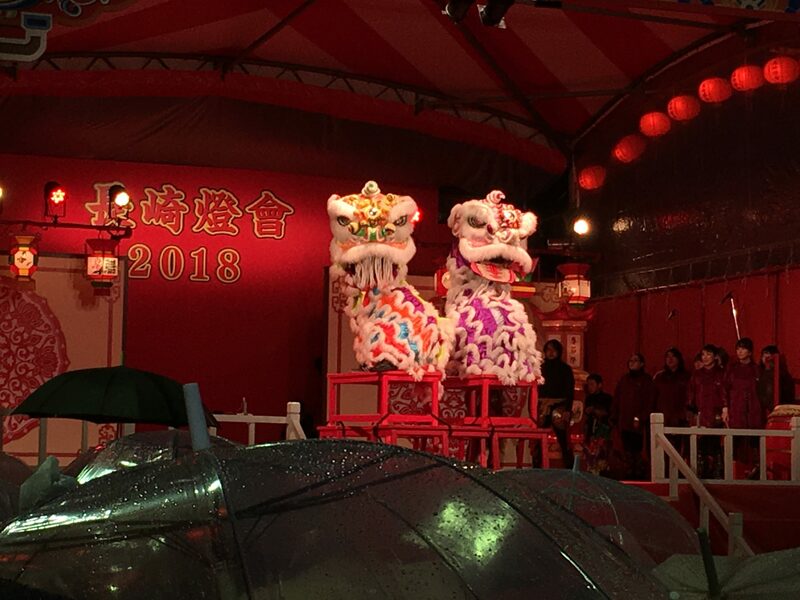 This is a lion dance. They also have dragon dance. 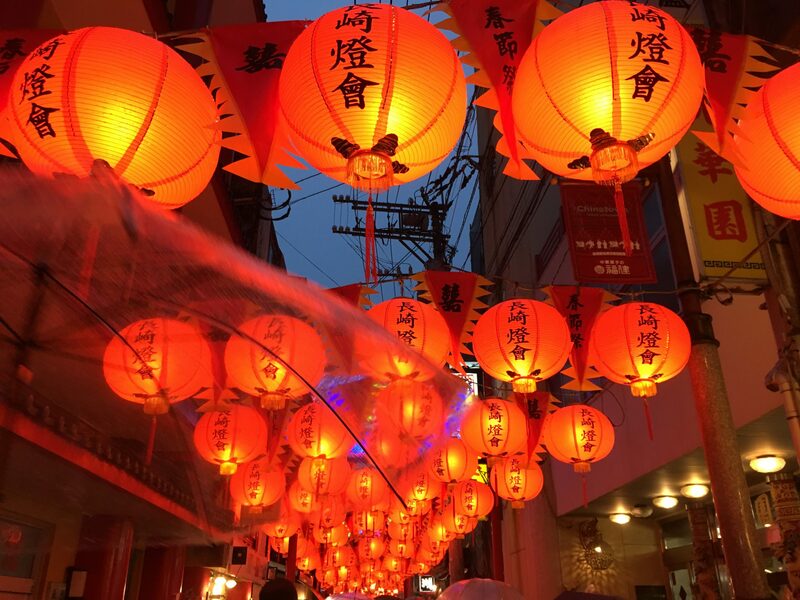 Pink colored lanterns are so beautiful. This one is near Spectacles bridge. 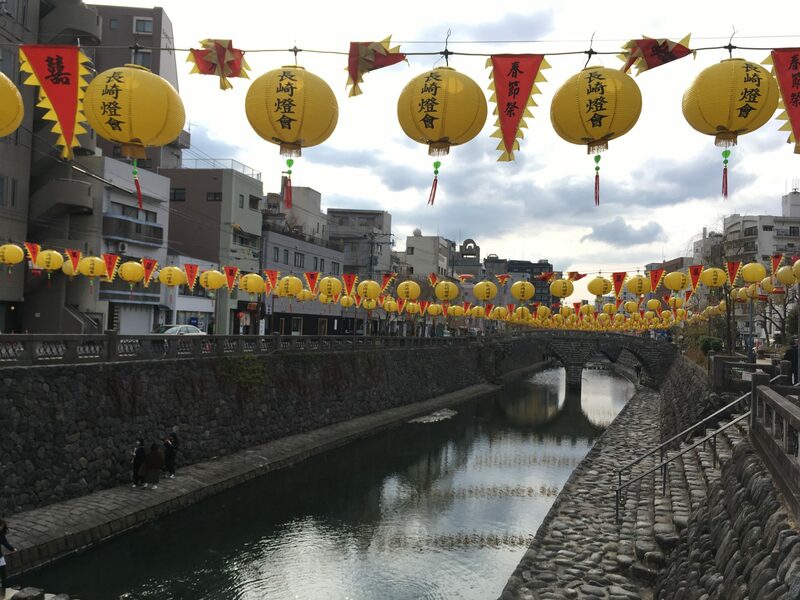 Yellow lanterns are so beautiful. 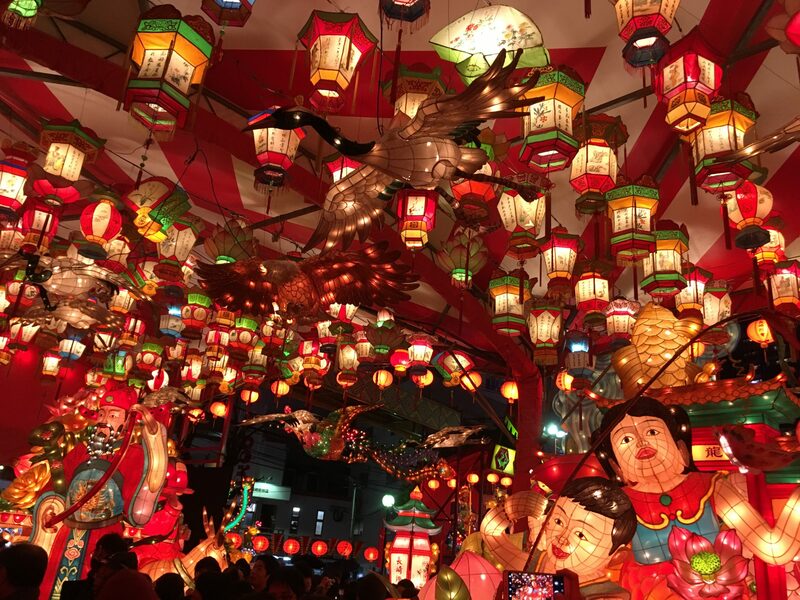 There are many guests who come to Nagasaki for the festival. They are illustrators and came to Nagasaki by hitchhiking. They became friends in the hostel. They are friendly Korean boys. 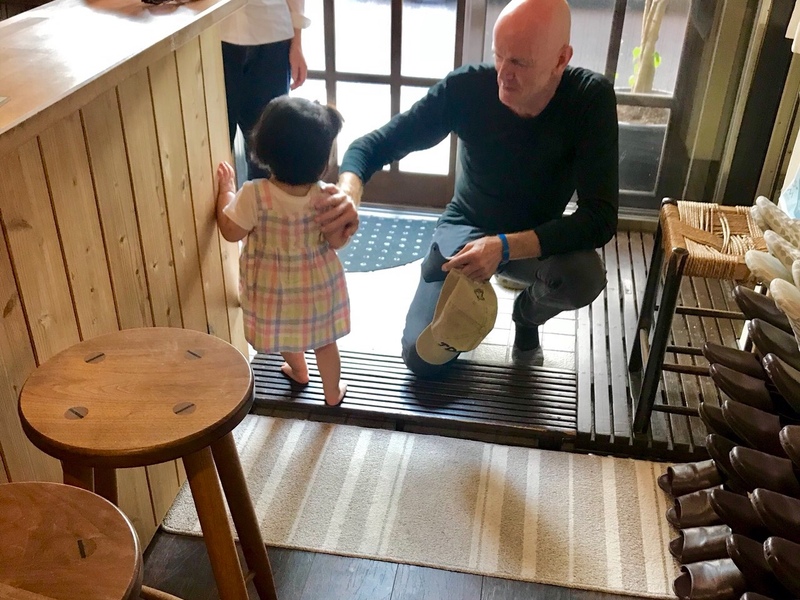 I hope they enjoyed their stay in Nagasaki. 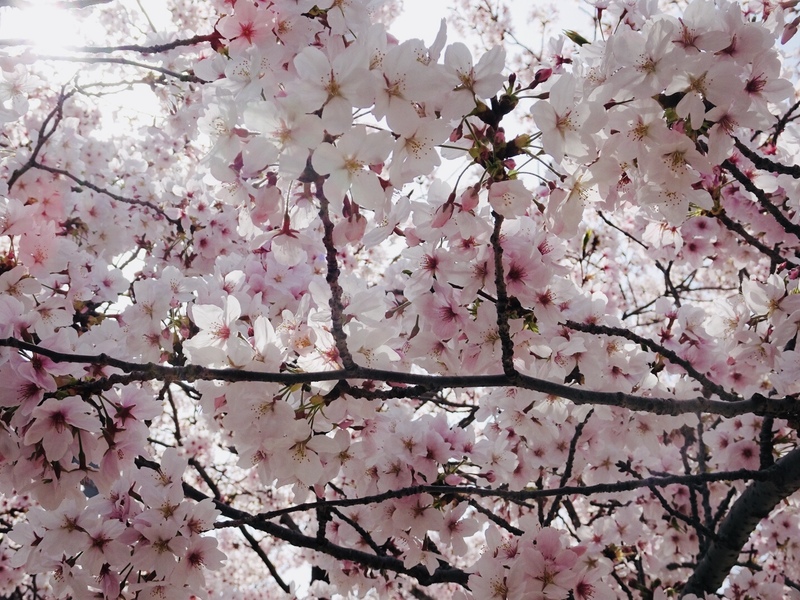 We’re excited to see Sakura flowers. It’s cold in Nagasaki city. 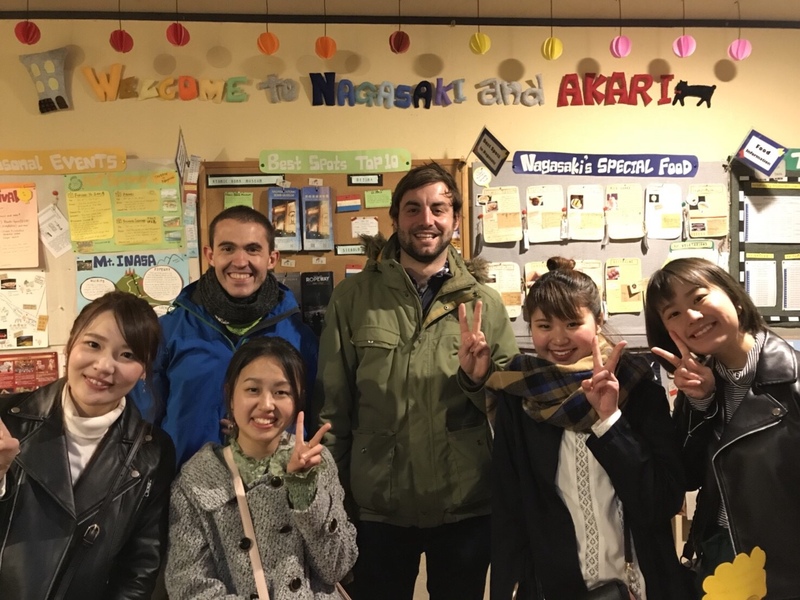 In January, we had guests who are college students from USA! 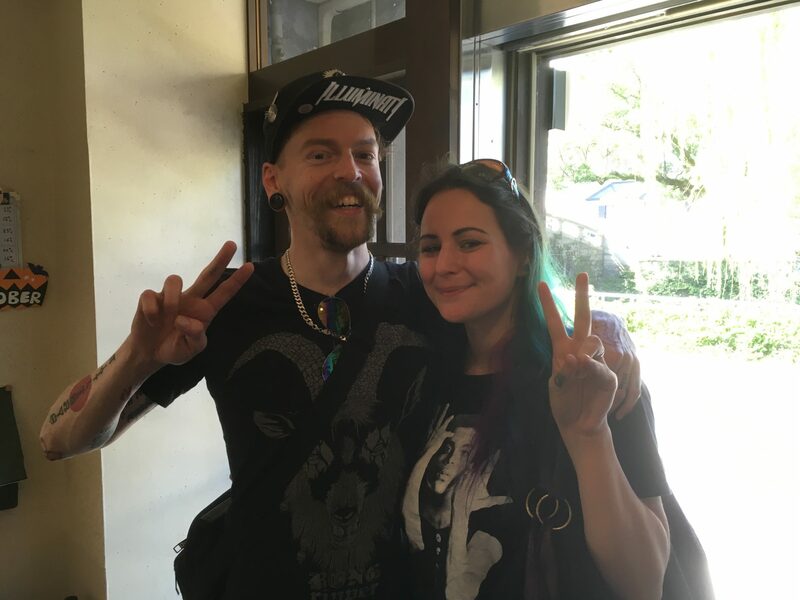 Thank you so much for your stay! 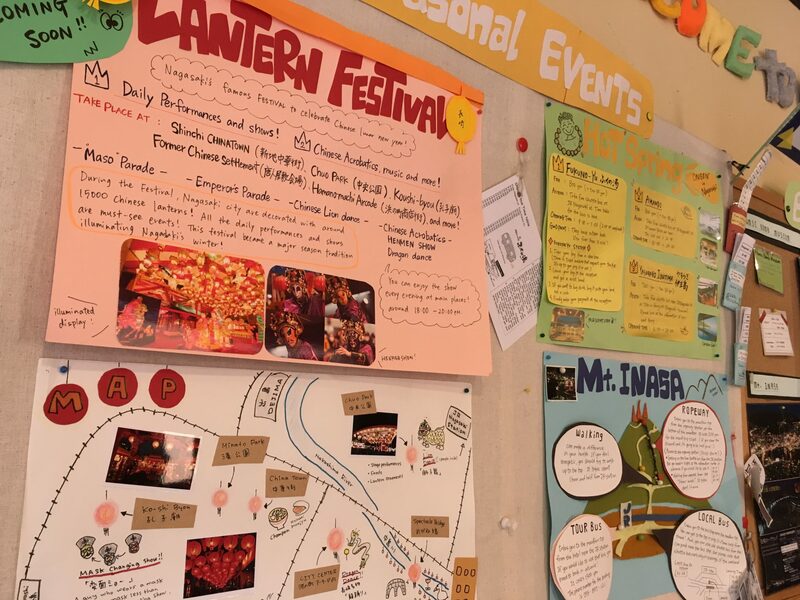 On the last day, each student had a presentation about what they discovered or learned about Japan. 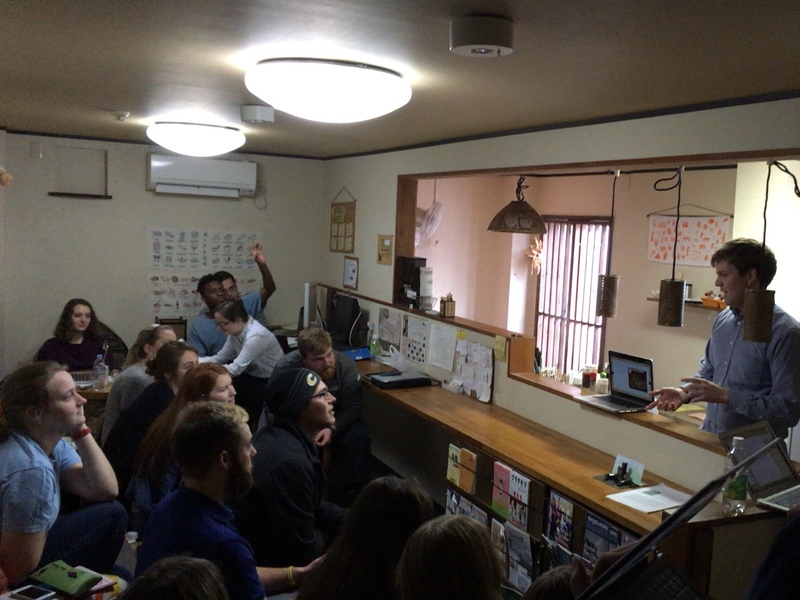 It was interesting to know how American students feel about Japan and what is interesting about Japan for them. After the presentation, we threw a farewell party. 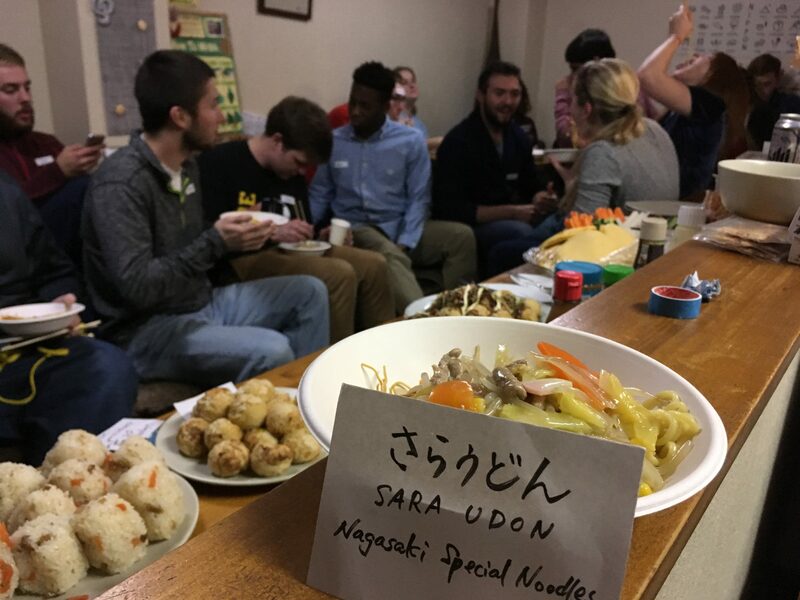 We served them Sara Udon which is one of Nagasaki specialities. 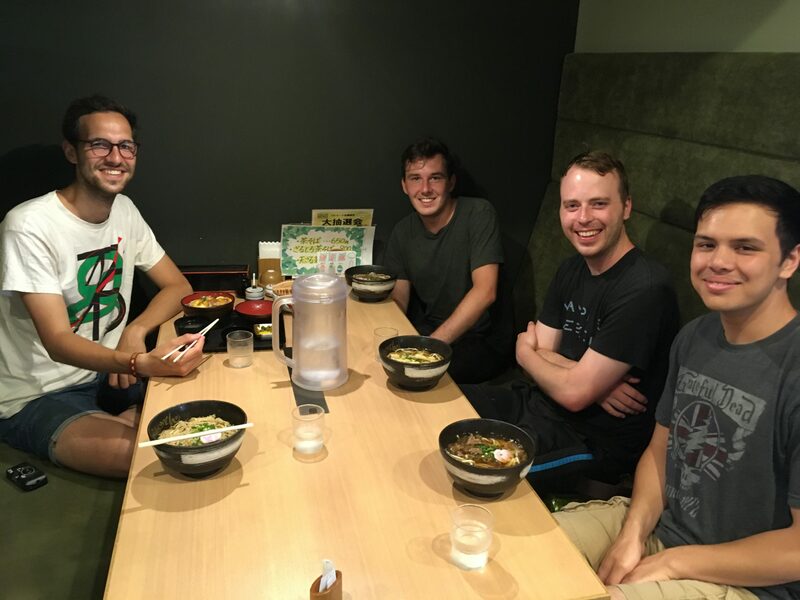 We had a really nice time with them! 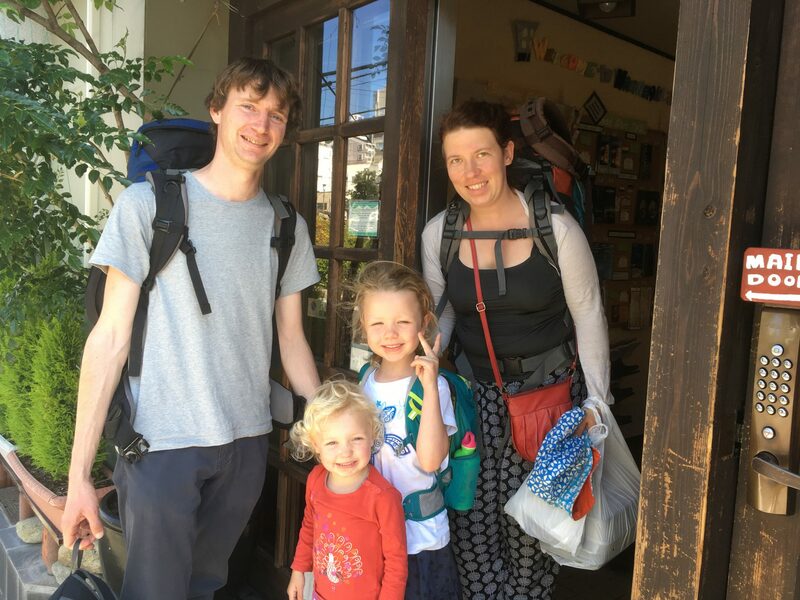 We hope they also enjoyed their stay in Nagasaki and come back to Nagasaki again. 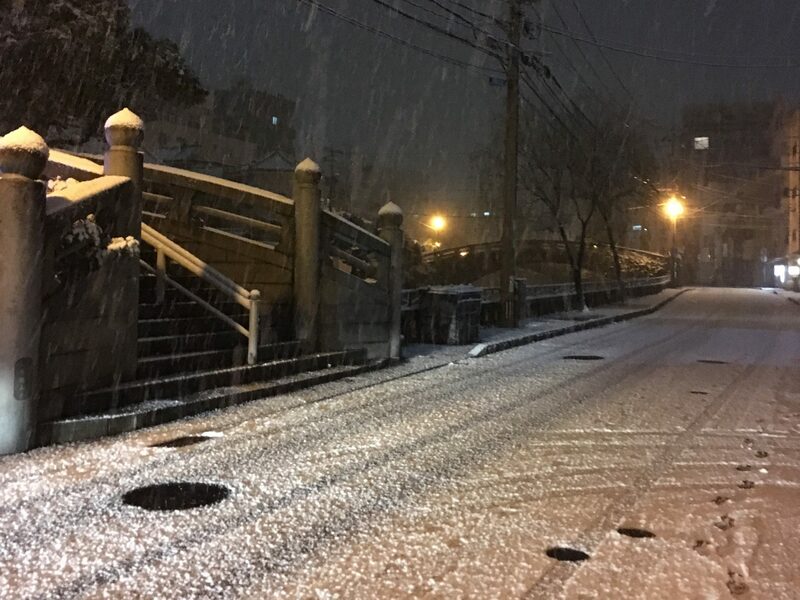 In the middle of January, we had heavy snow. 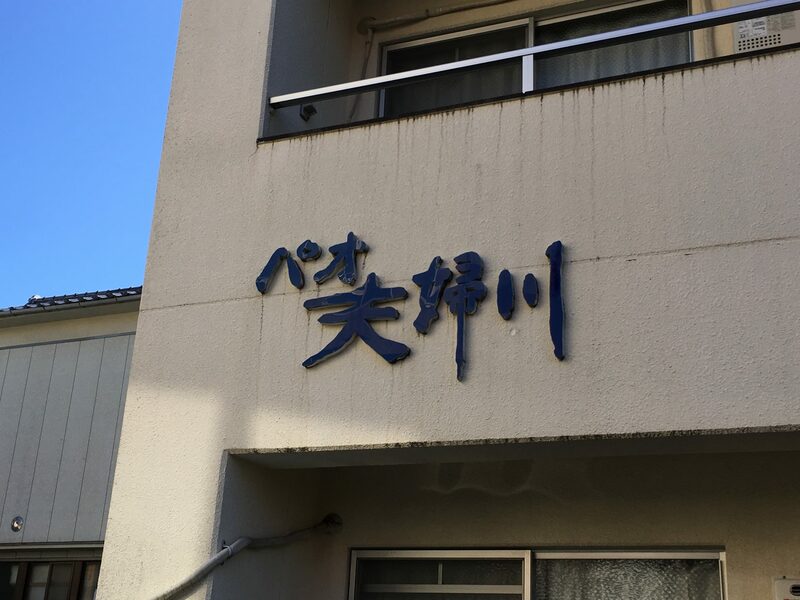 This is a neighbor of Hostel AKARI. 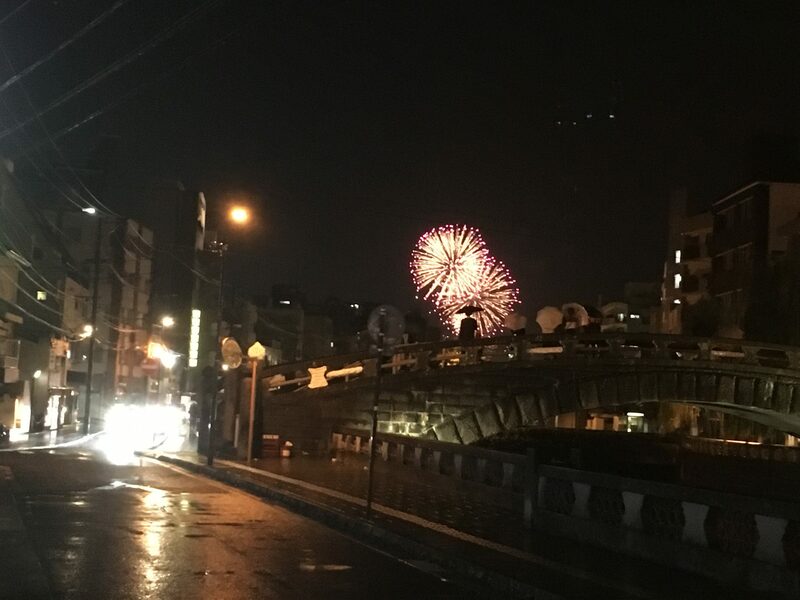 As February starts, they already started preparing Lantern Festival that is going on between 16th Feb and 4th Mar. We made an original information board. 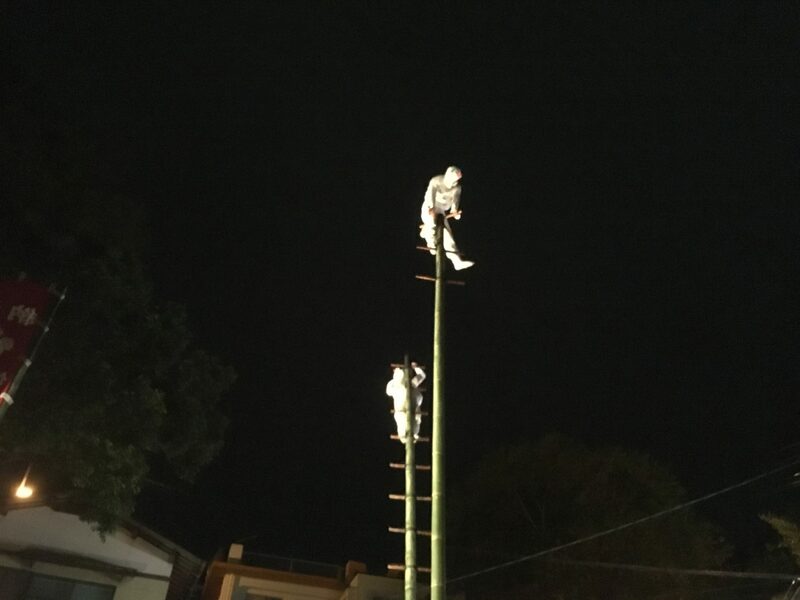 If you have an opportunity, please have a look at it and enjoy the festival. 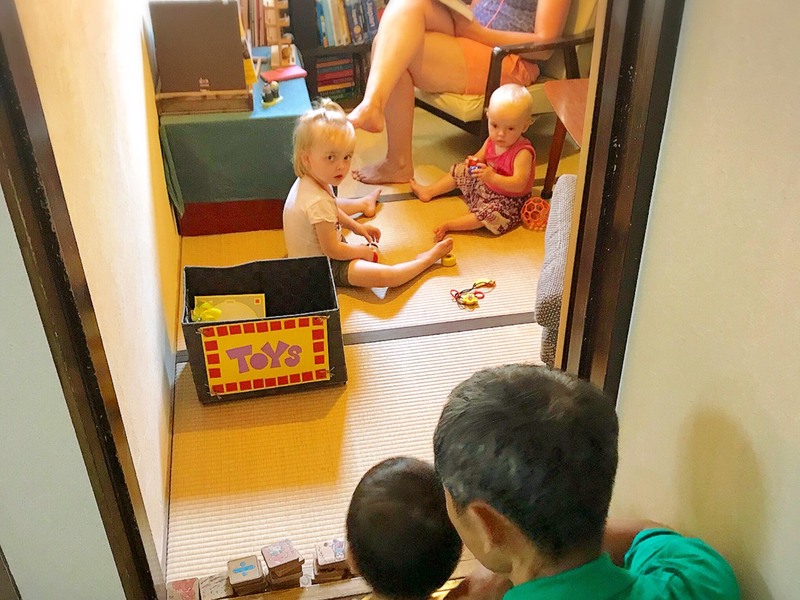 Recently, we have many family guests. 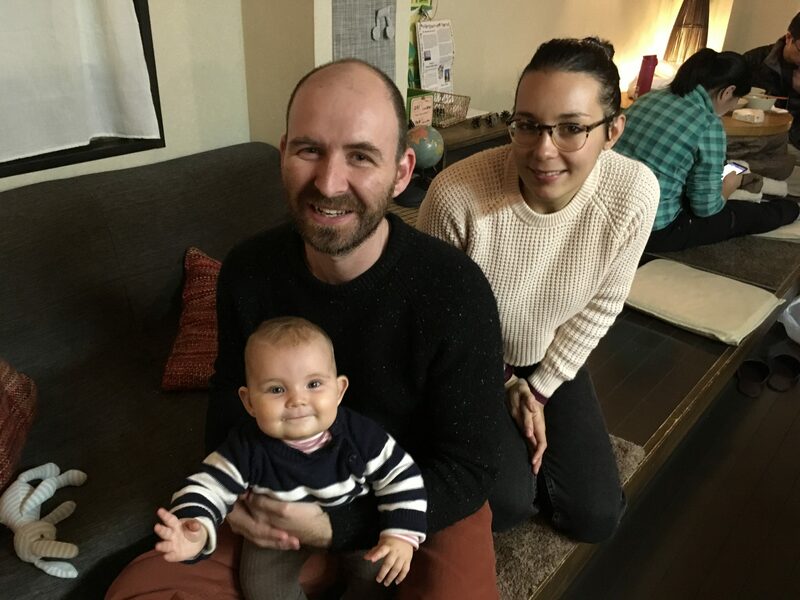 This cute family is from Spain. 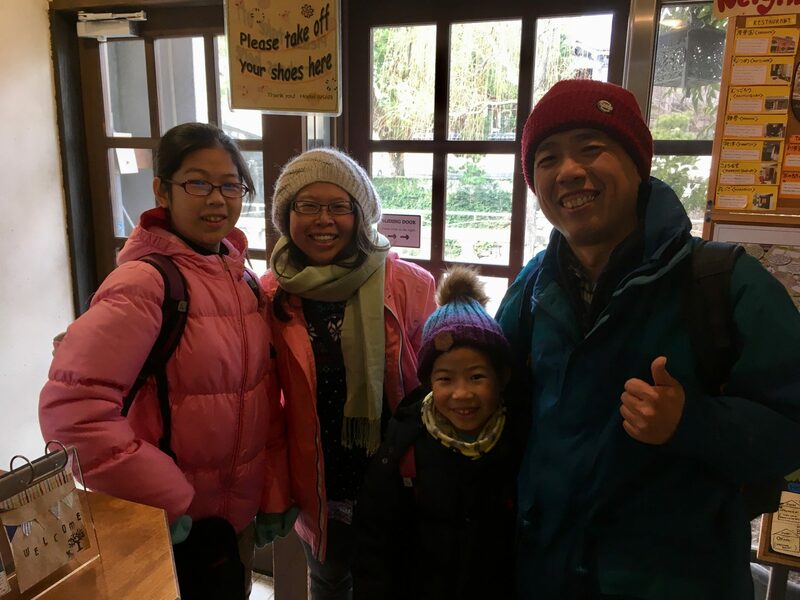 This family is from Taiwan. Thank you for your stay! 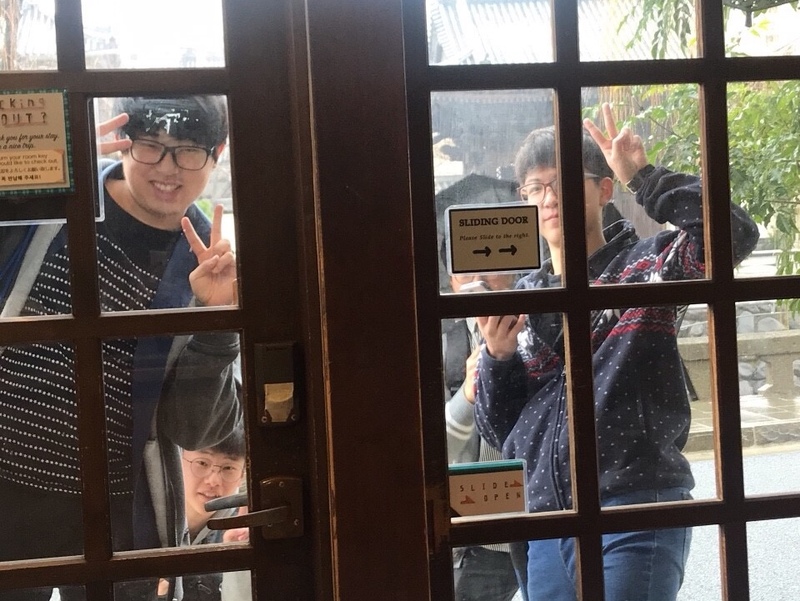 It’s getting cold in Japan. Take a good care of yourself everybody. Hi, this is the first post in 2018. How did you spend New Year season? 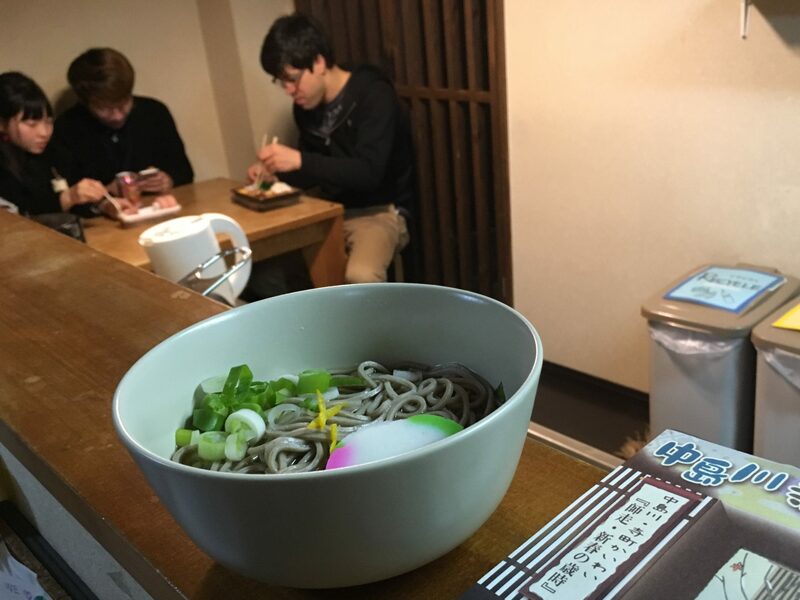 On New Year’s eve, we had soba noodle in the living room, and headed to a temple hit the bell. 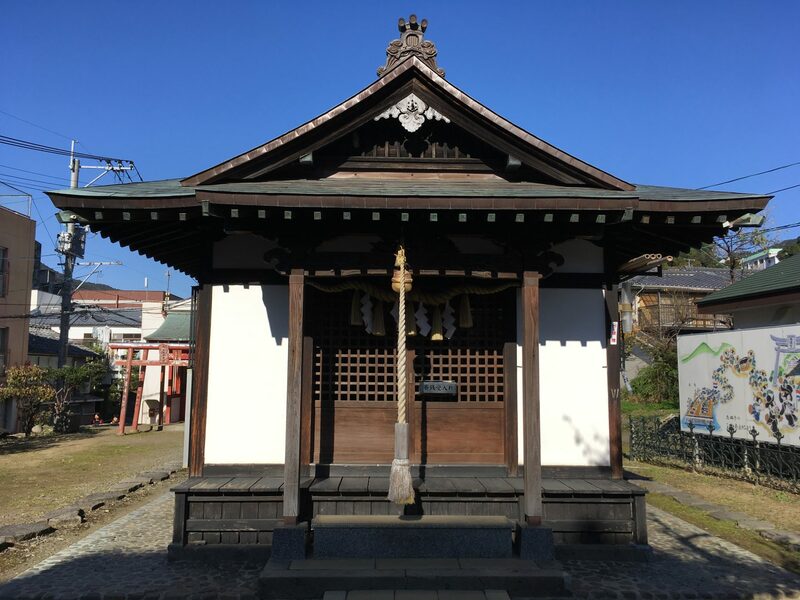 Hitting the bell in a temple is a Japanese custom to celebrate New Year. After having the soba noodle, we went to this temple. We luckily had Matcha inside the temple. 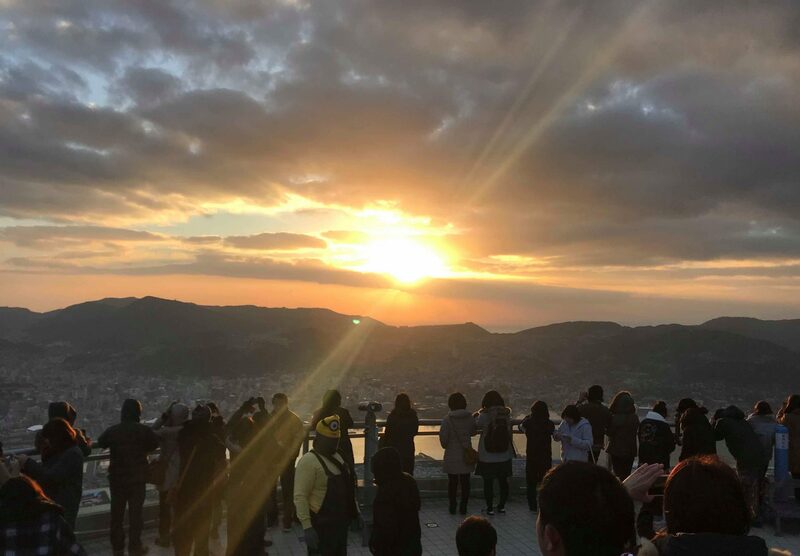 This one is a first sunrise in 2018. 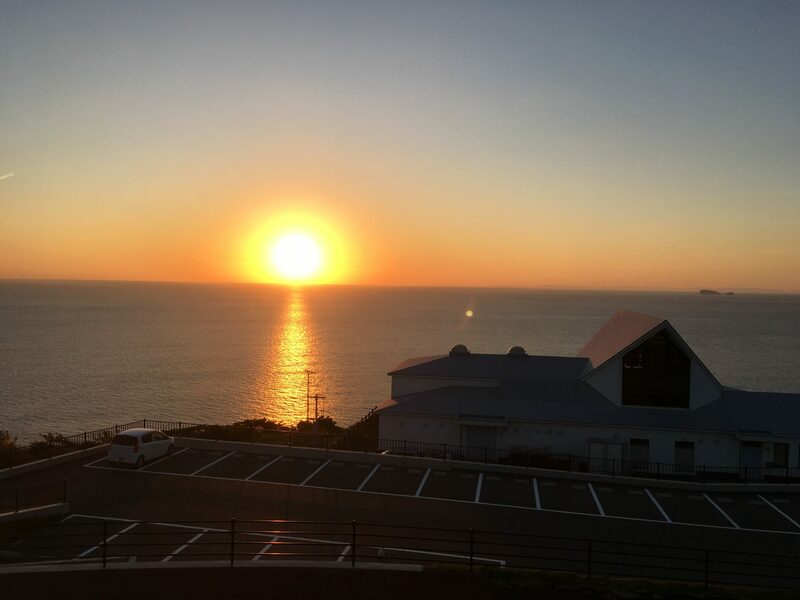 It’s said that the first sunrise is a fortune thing in Japan. We put a calender at the reception. 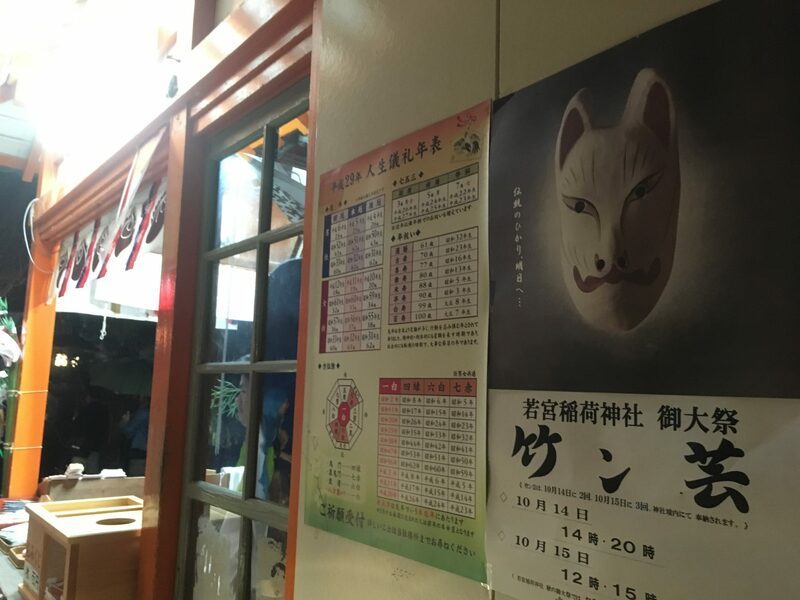 It’s getting colder and colder in Nagasaki. Looks like winter is coming. 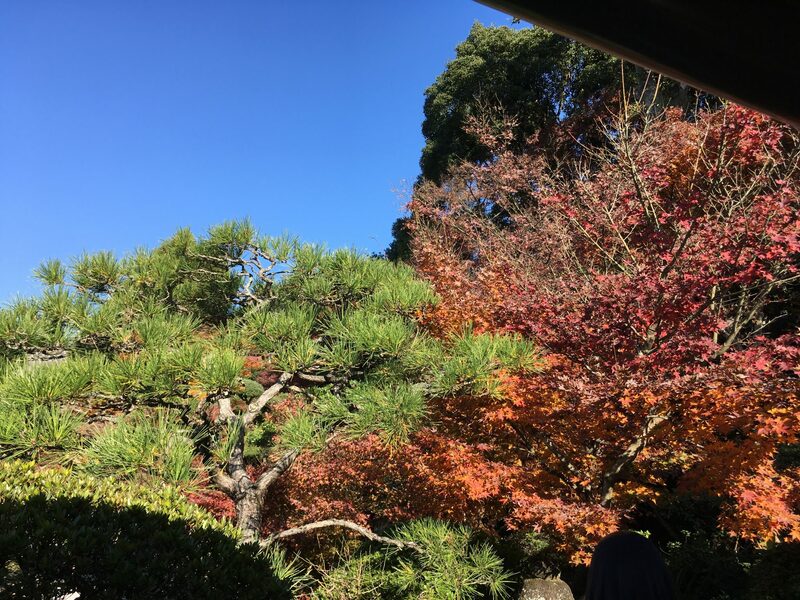 We took a walk to Japanese garden with beautiful Autumn leaves. It took about 15minutes to get there. 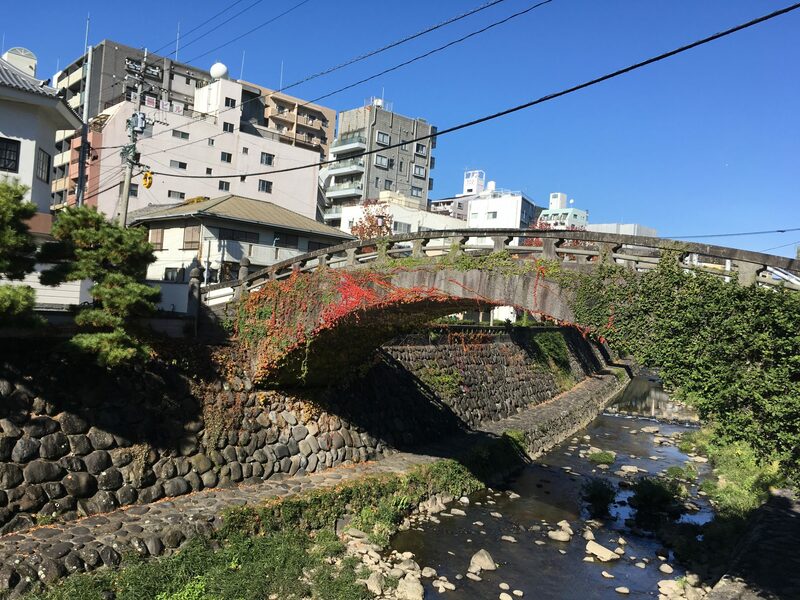 On the way to the garden, we saw this stone bridge covered with leaves. 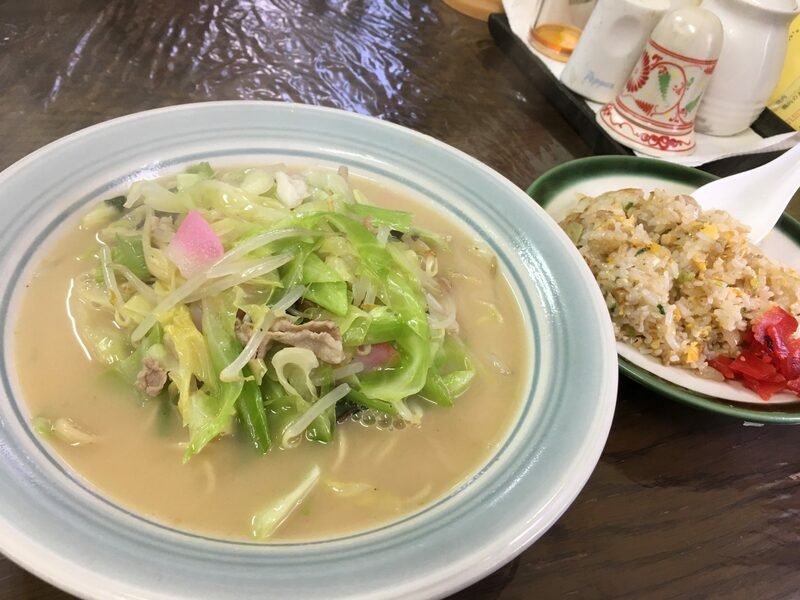 And we had Champon for a lunch. 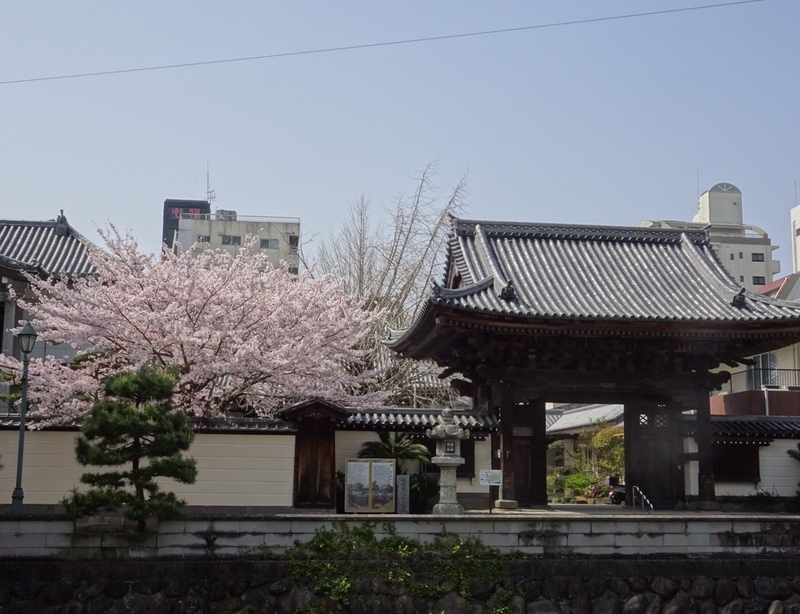 This is a traditional gate for the garden. 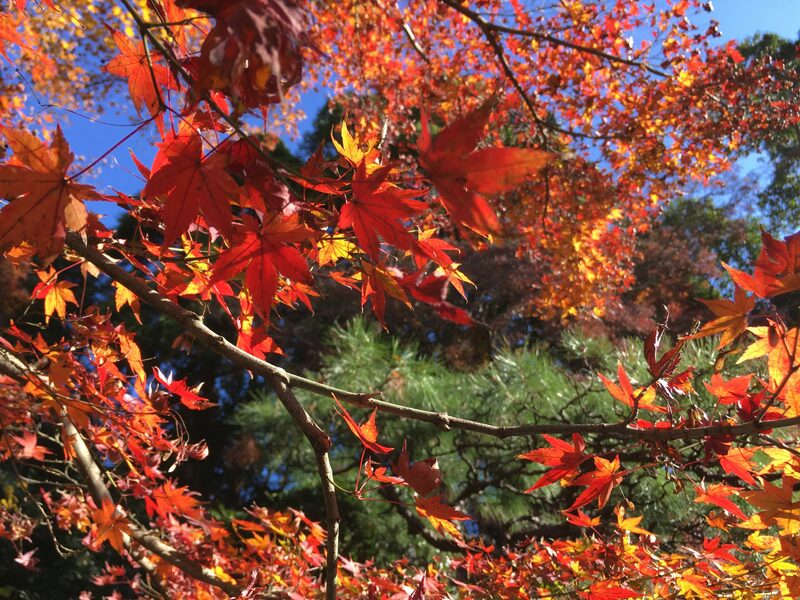 In the garden, we saw these beautiful Autumn leaves. 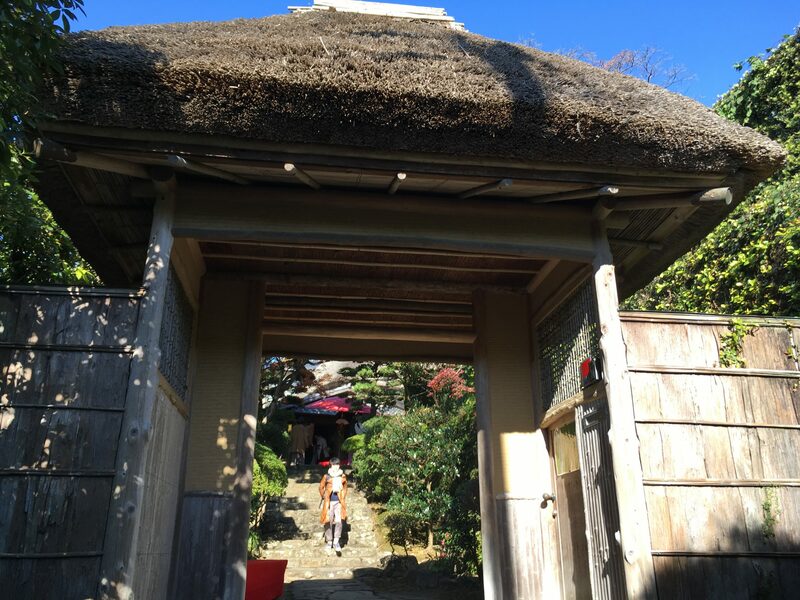 There is a Japanese traditional house. Inside the house, you can enjoy some Matcha. Had a look at the garden. 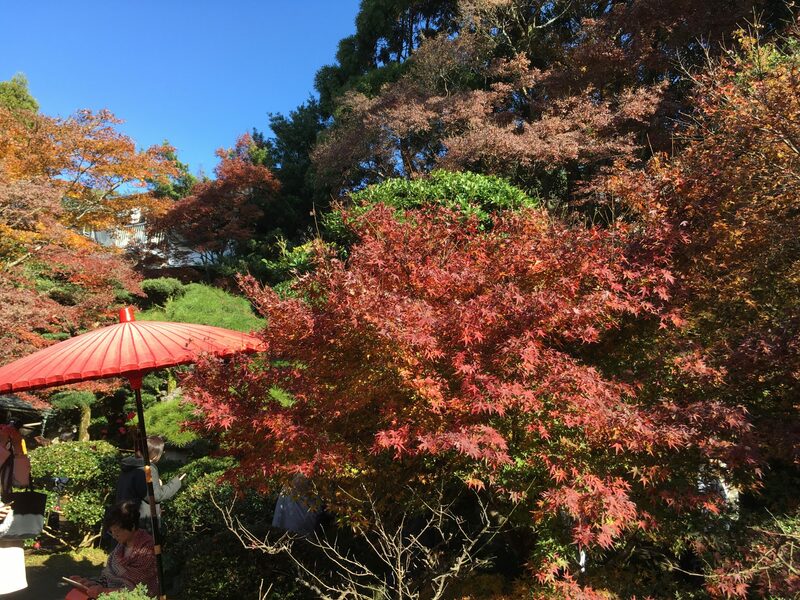 Green trees, blue sky, red leaves. What can we get more? 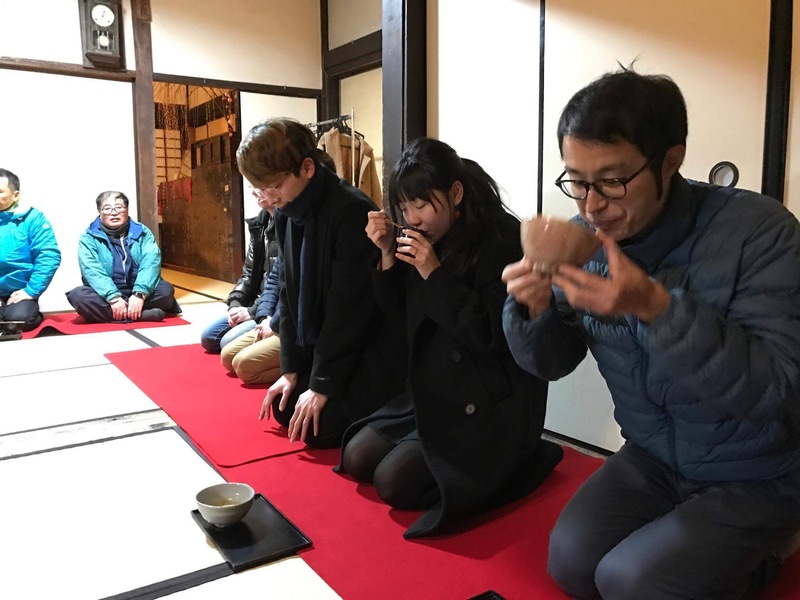 There was Koto playing inside the house. 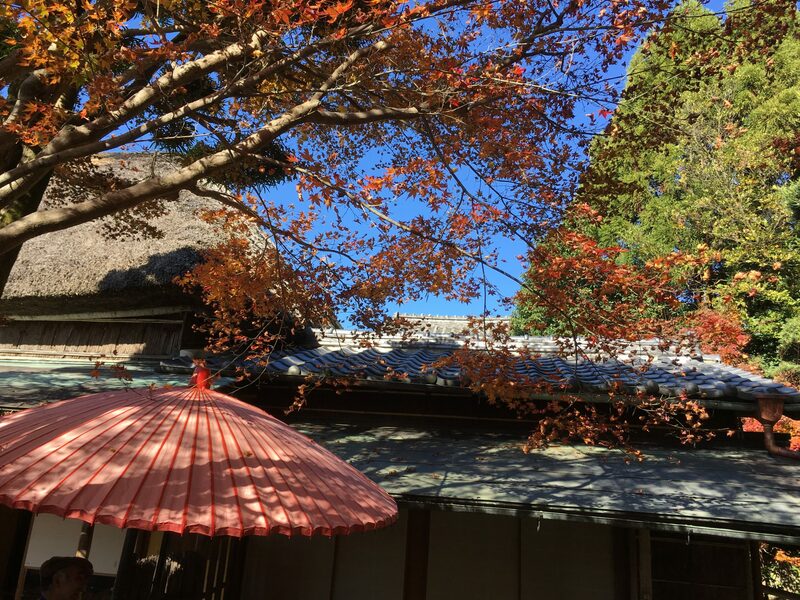 It feels so good to hear Koto playing while looking at Autumn leaves. We headed back to the hostel. 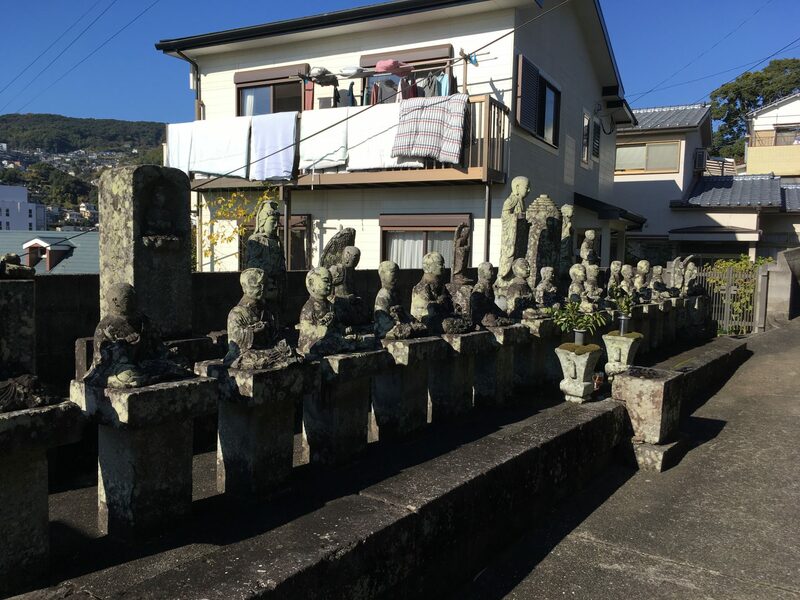 We encountered these stone buddha statues. 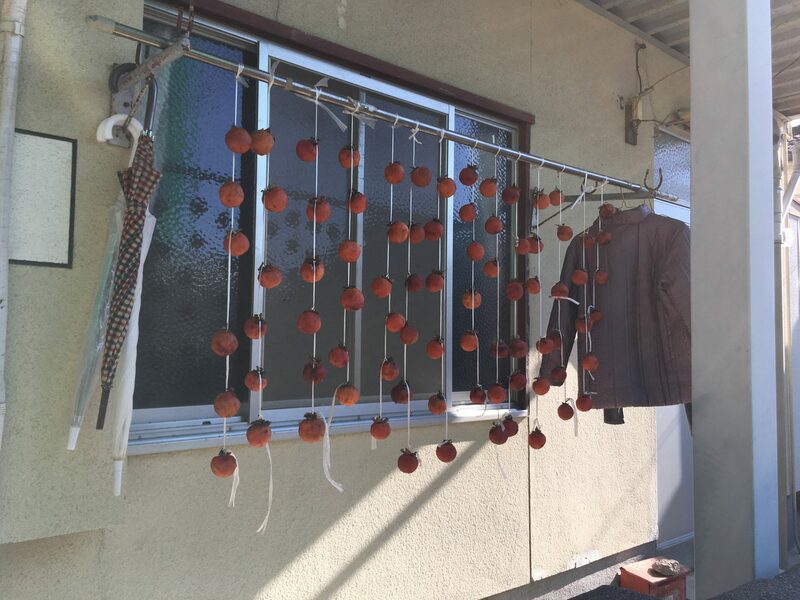 Somebody was drying these Japanese persimmon. Looks so yummy but we never touched them because we are not allowed. 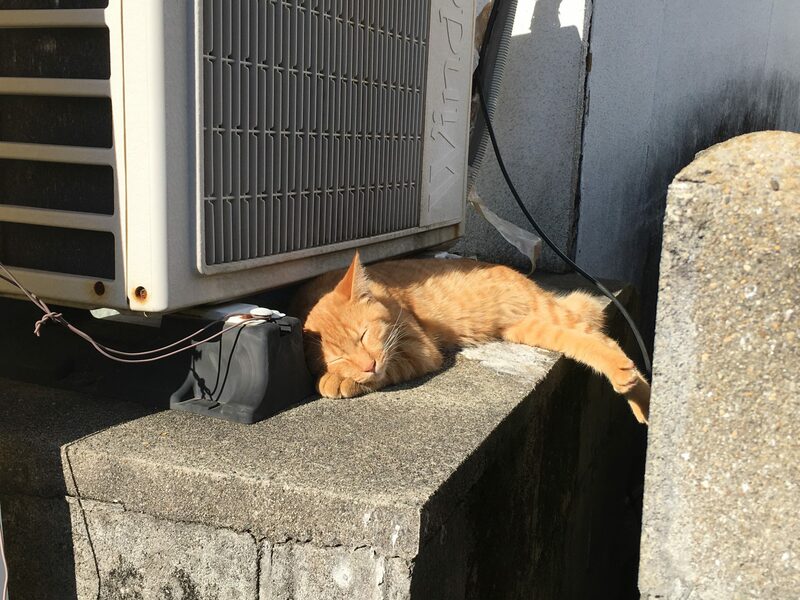 The weather was so nice this cat felt asleep. We came across this shrine. 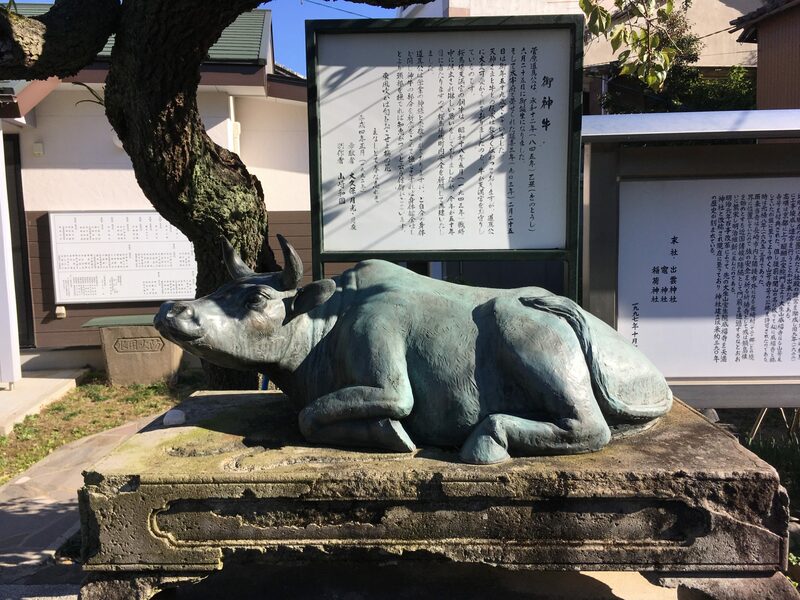 If you touch a part of this god caw, the part of your body gets better according to a traditional history. 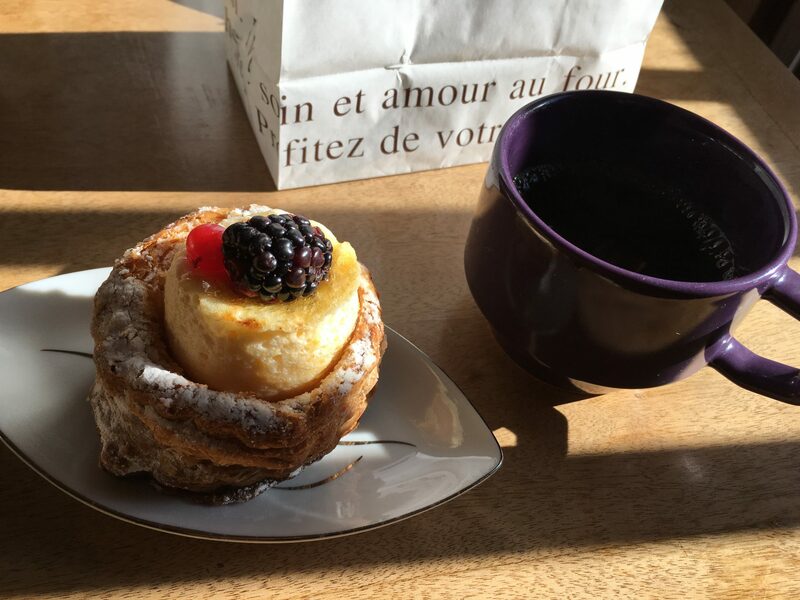 We had a cake after getting back to the hostel. It was a nice lunch break. 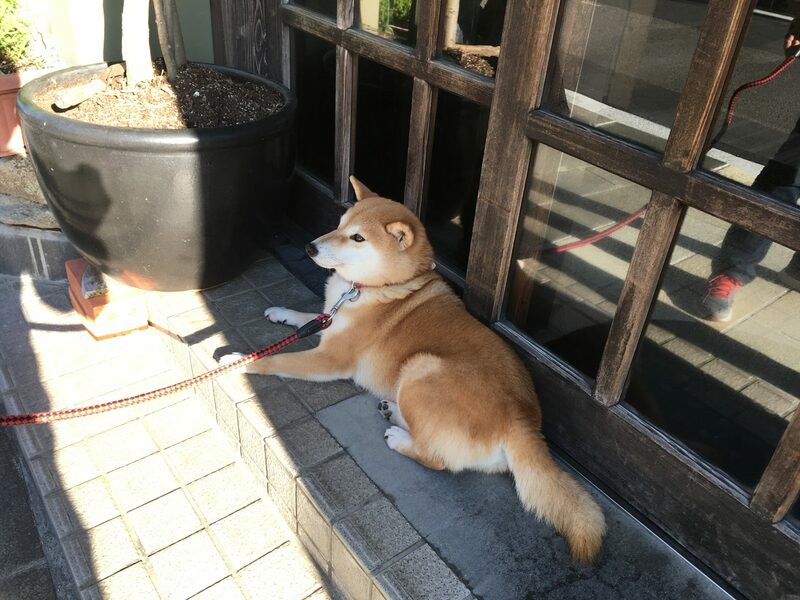 This dog like our entrance so much he doesn’t want to stand up. He was there for about 10minutes. Have a wonderful Autumn day!! 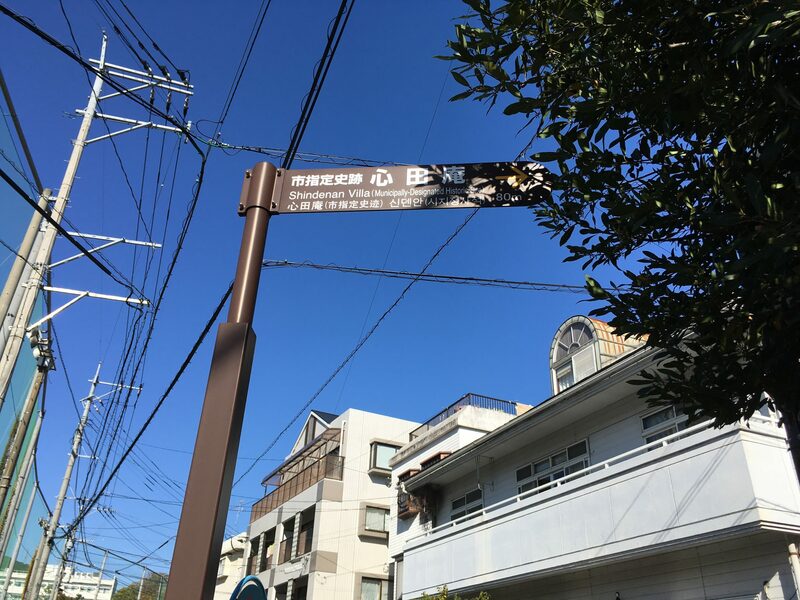 It’s getting colder in Nagasaki city. 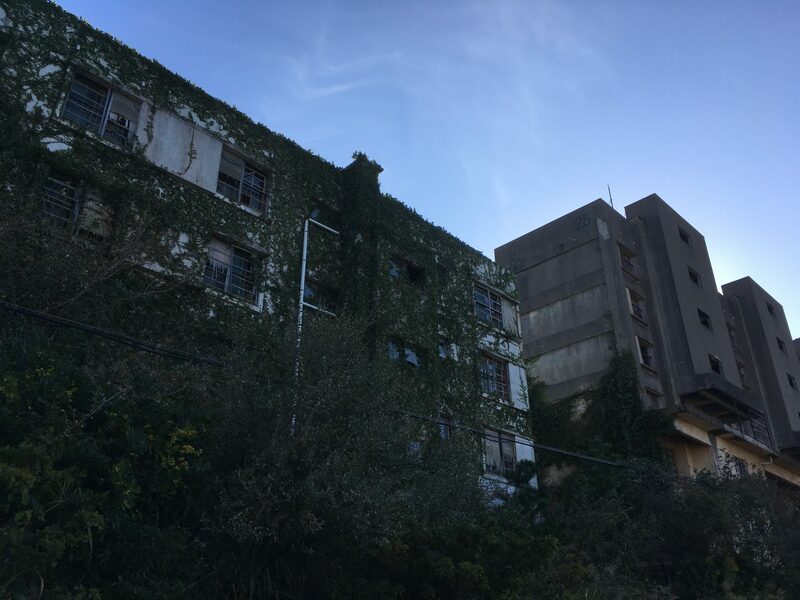 If you have visited Nagasaki city, some of you might have visited Gunkanjima, a.k.a Battleship Island. 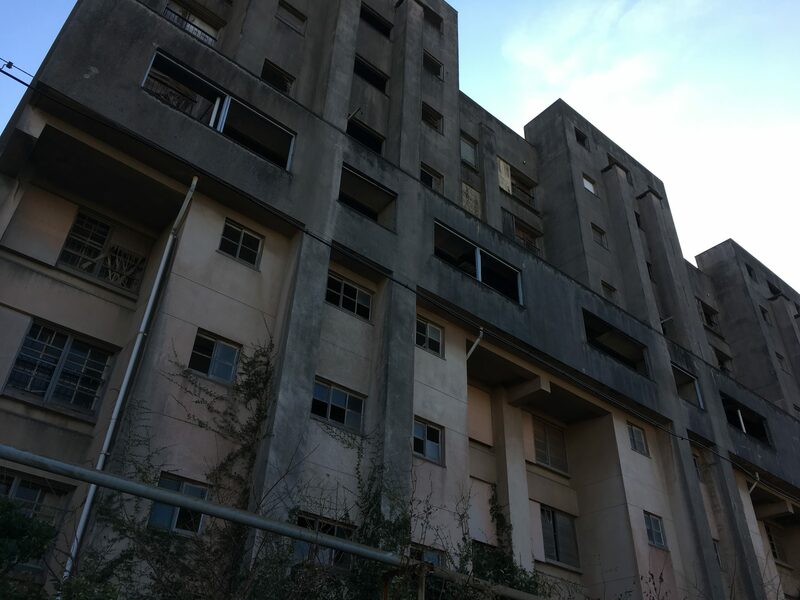 Gunkanjima had been known as a coal mine island until 1970. 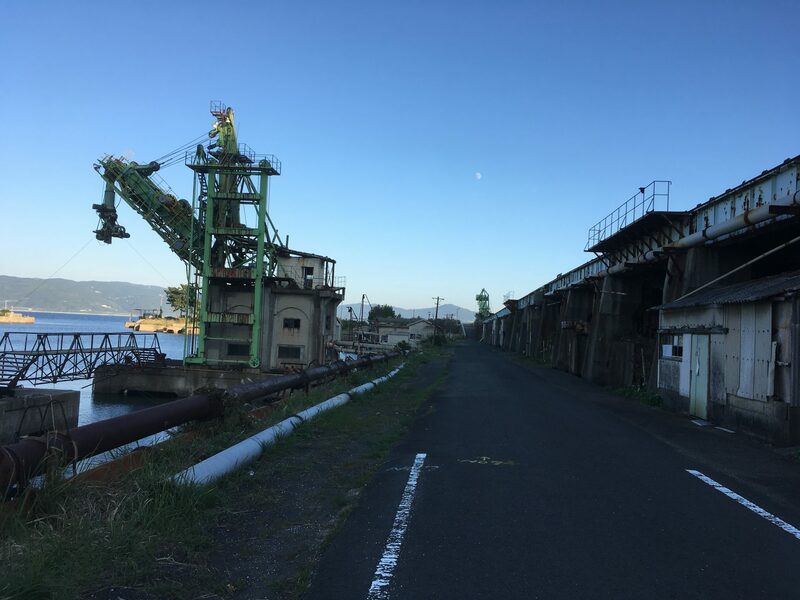 Now it’s famous as an abandoned place with buildings that look like they are about to corrupt and rusty big machines used for coal mine. 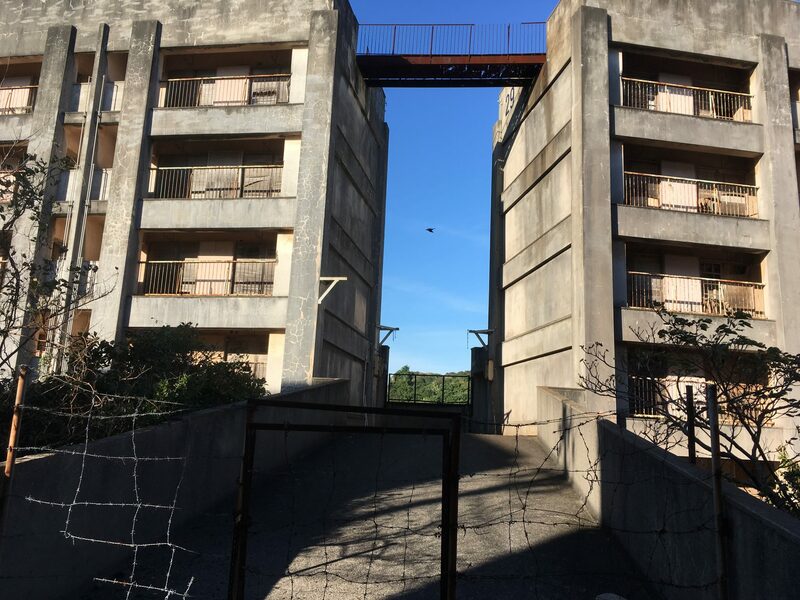 There is another island similar to Gunkanjima. 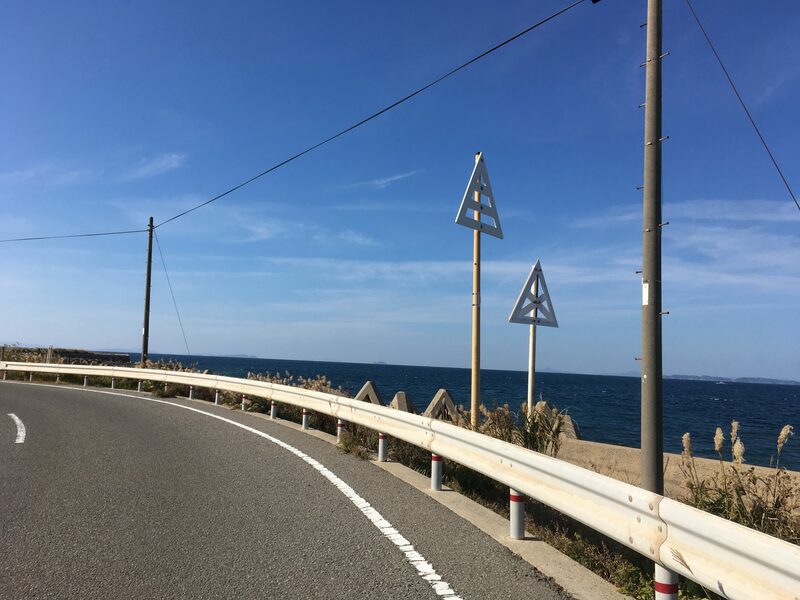 It’s called Ikeshima island. In Japanese, 池島(いけしま). 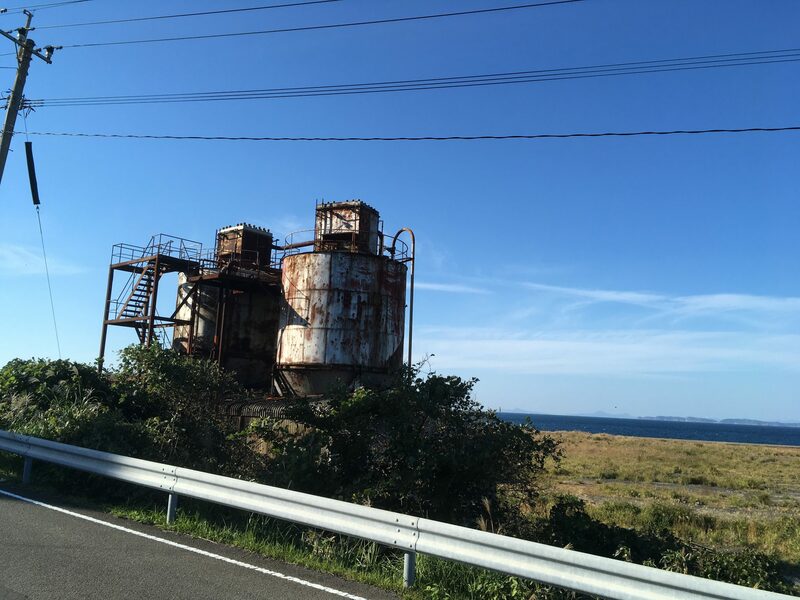 Ikeshima was also coal mine island and you can still see abandoned buildings and machines. 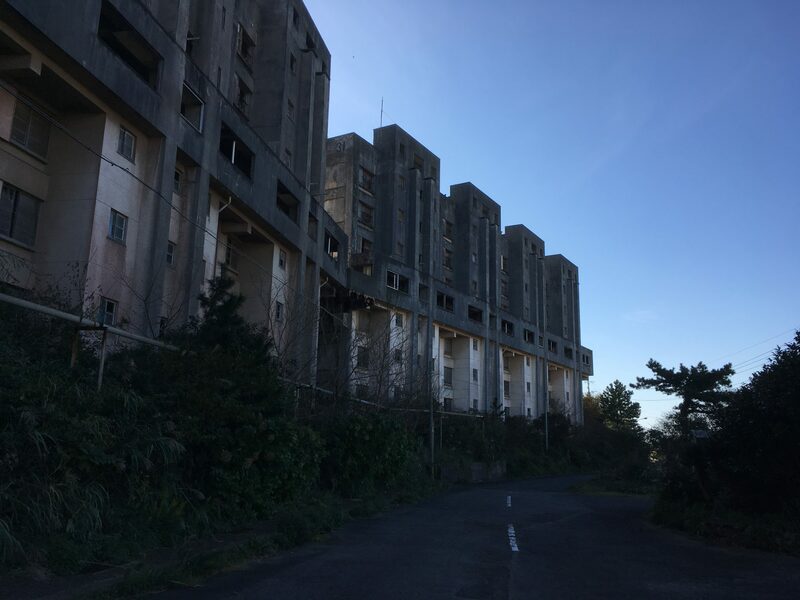 But there are still people living there, so the island itself is not exactly abandoned unlike Gunkanjima. 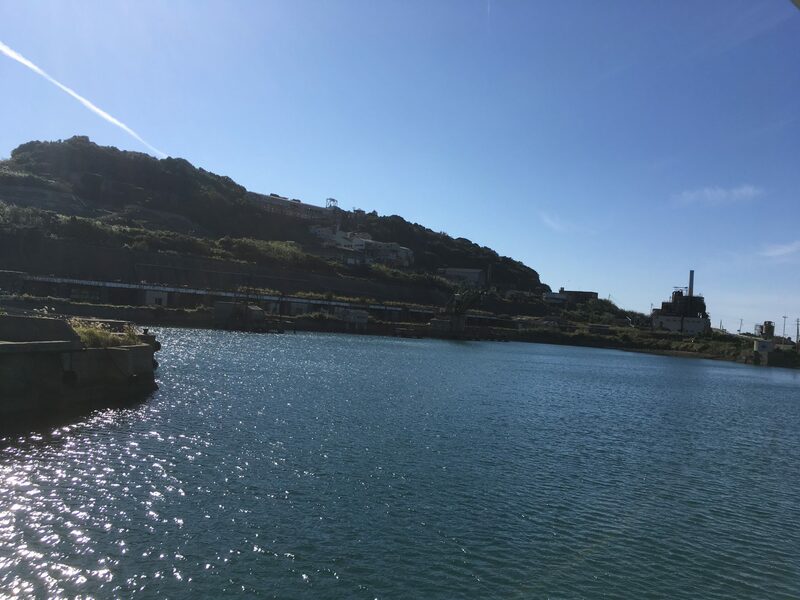 It’s a quite interesting island, so I took a walk around the island the other day. **Everybody can enter the island without permission or fee. 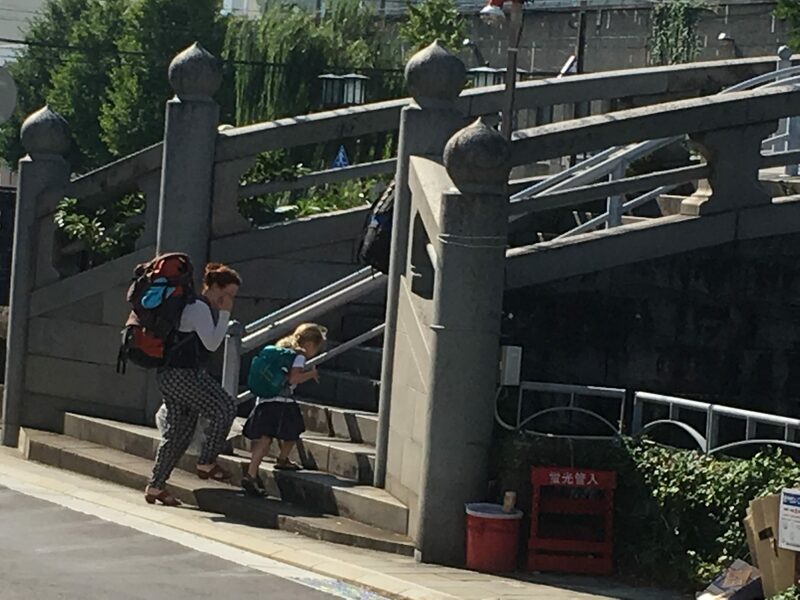 The port for ferry to Ikeshima is not easy to access unless you have a car. It takes about 50minutes with a car to get to the port. I bought a ticket first. It cost 410yen one way. 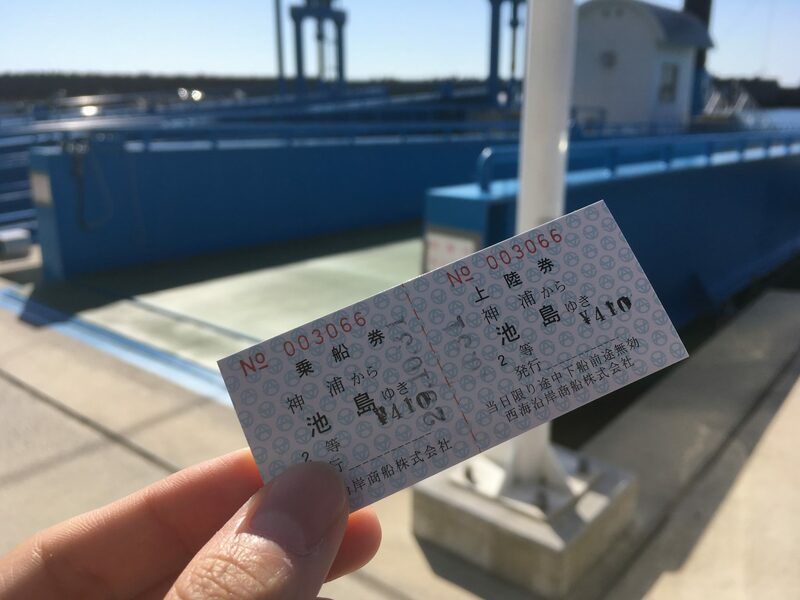 It was 15minutes-ride on the ferry. As I reached the island, I started walking around. 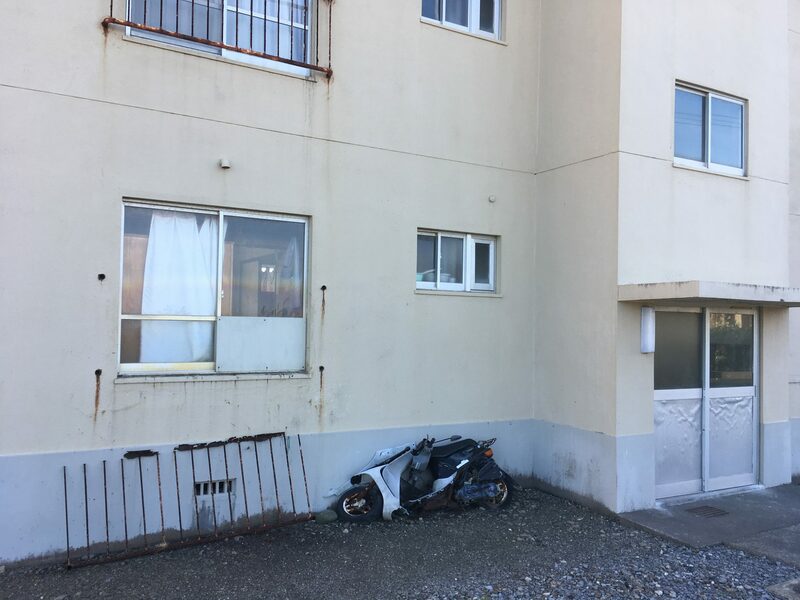 There was a broken motorcycle. It reminded me that I was on an island with very few people. 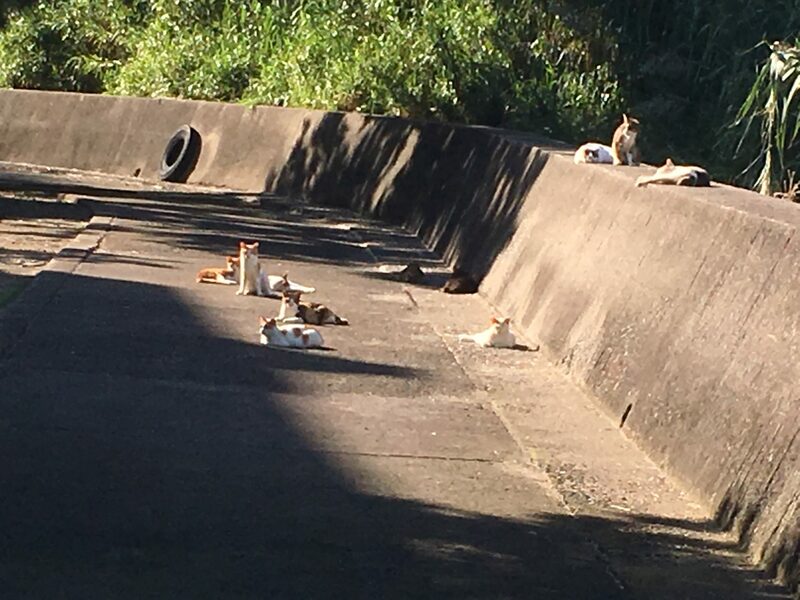 The island is also famous for having many many cats. You can see views like this on the island. Rusty facilities like this one with beautiful sea and field. 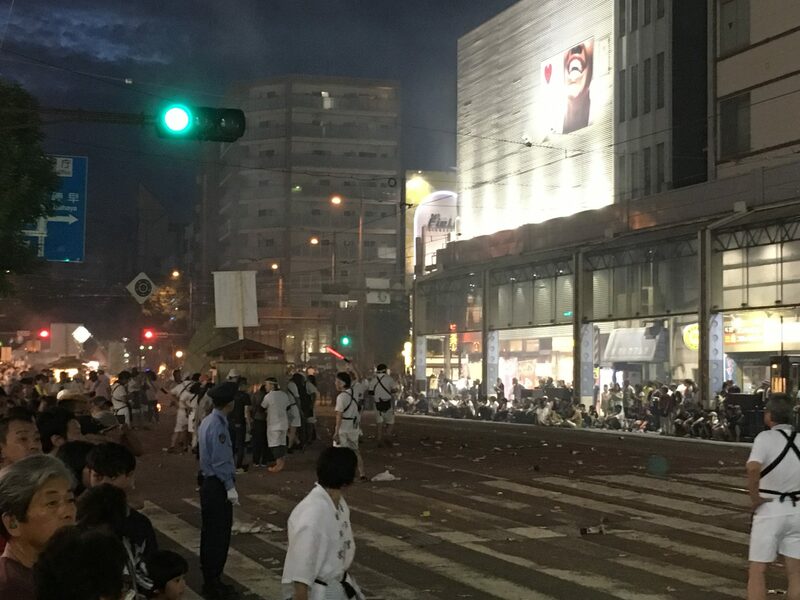 It’s an area where shops were concentrated. This one is a school with a big field. 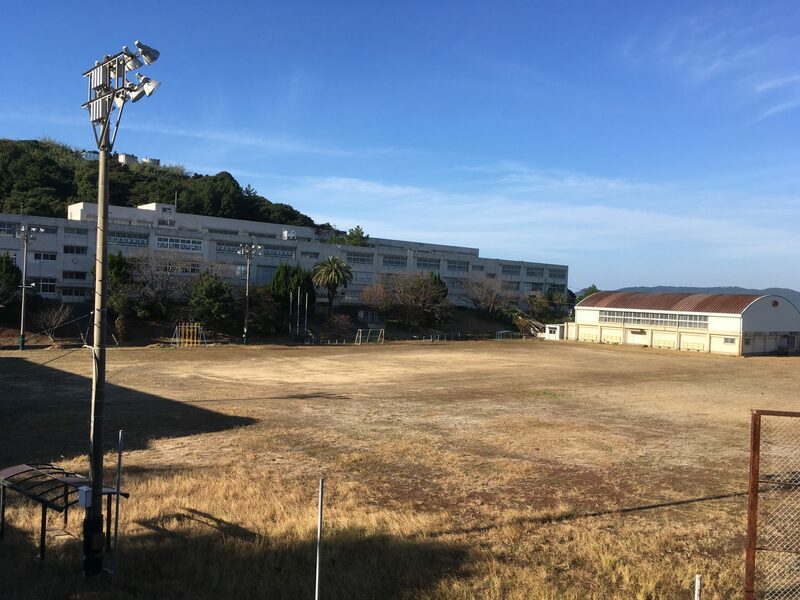 I imagined there were many students playing on this field back in the day. 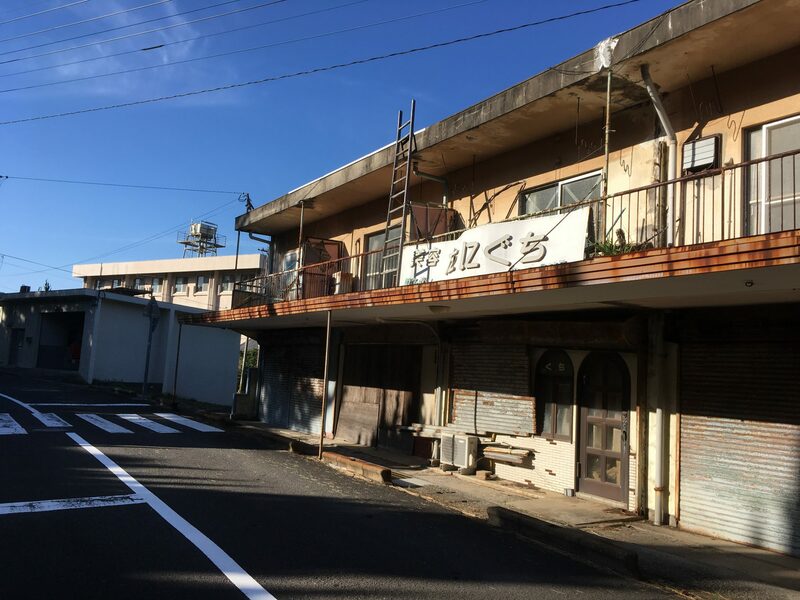 If you go more forward the school, you will see the apartments area. This building is covered with leaves, which made it photogenic. Some pieces of windows are fallen. 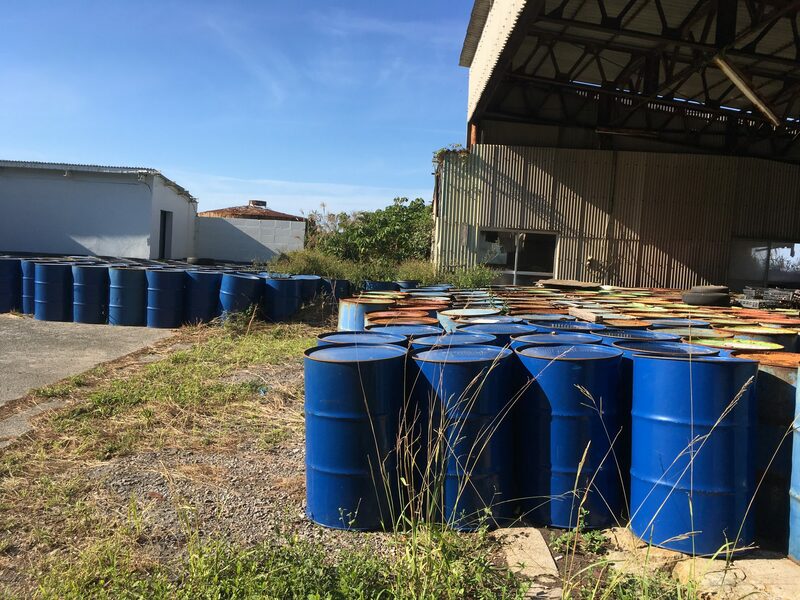 There are people living near the port, but in these apartments, nobody lives anymore. 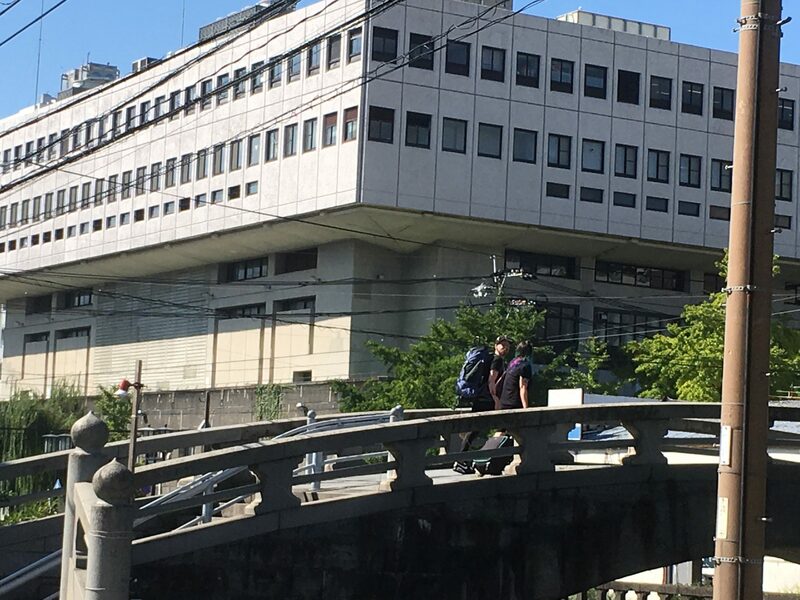 Looks like one scene or set in a movie. It’s a corridor that made people easy to get across the building. People didn’t have to take stairs inside the building, but they just came there with a micro bus and go directly to 3rd or 4th floor. This is because there was no elevator at that time. I came across this small compartment what looks like it’s used to be an office. 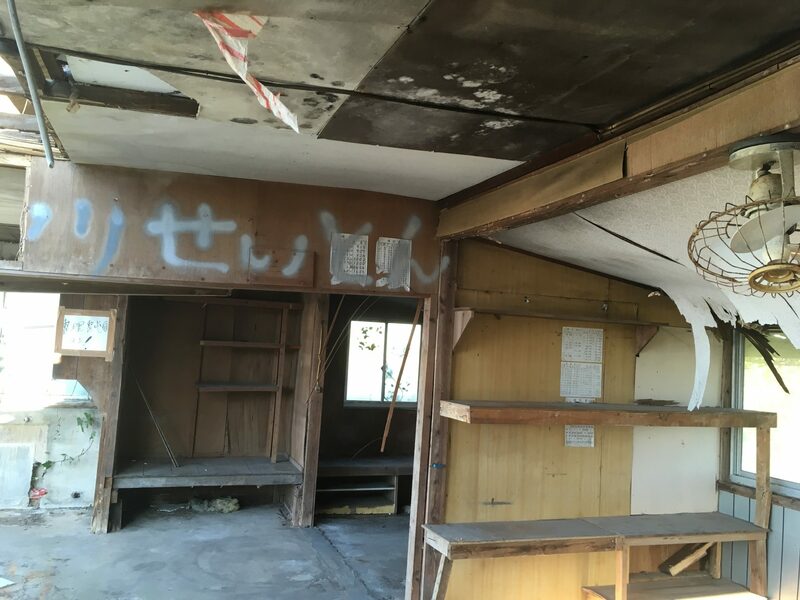 They drew their slogan on the wall in Japanese. 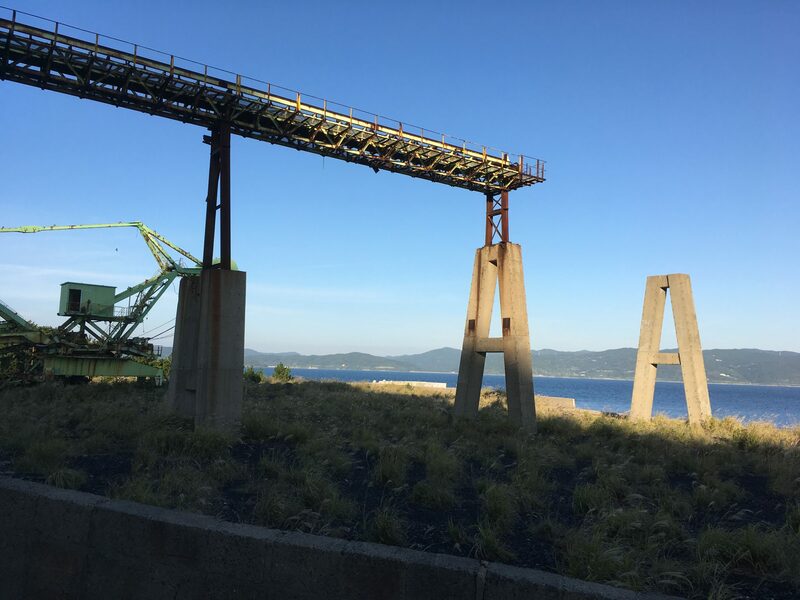 This is a belt conveyer to bring mines to a ship. 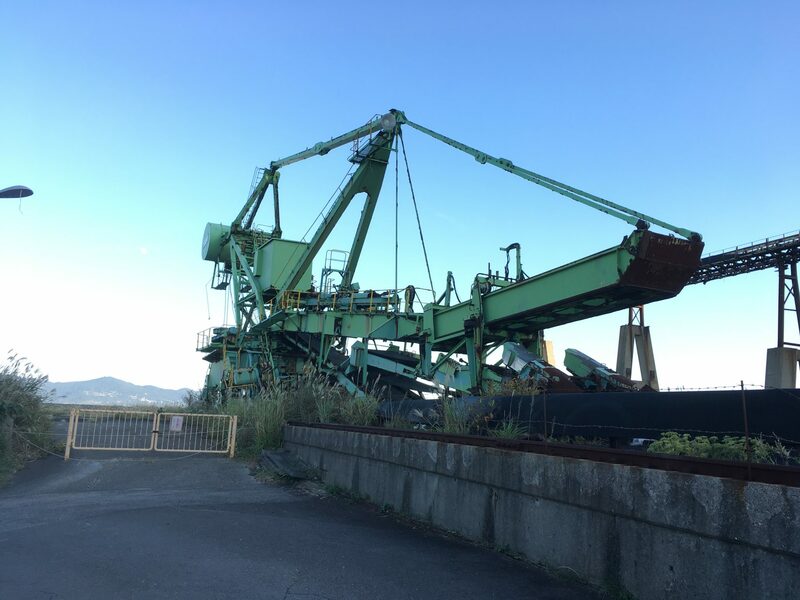 This one is a machine that carry mines and bring them to the conveyer. There are still cranes and railways without taken care of. You can see the railway running from the right to the left in the picture. 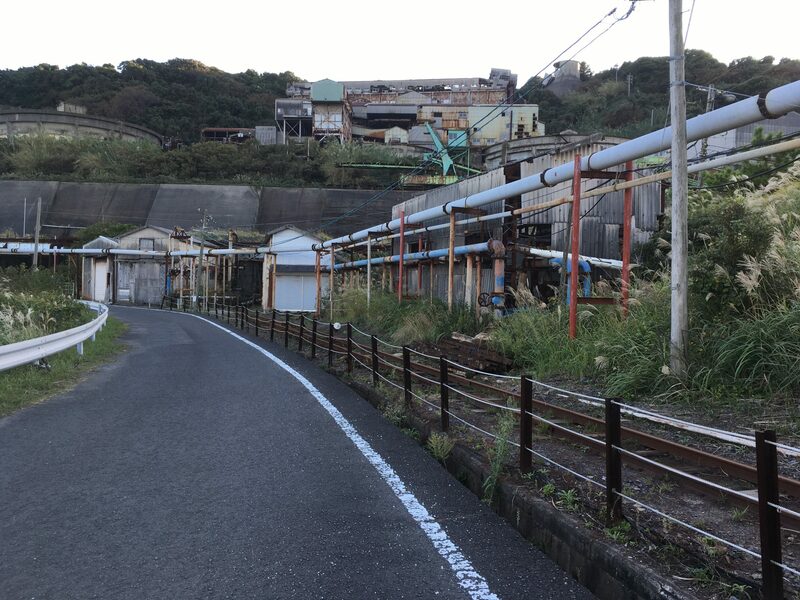 It used to lead workers to inside coal mine. There is a sightseeing tour where you can ride a tram and go inside the mine, and get a explanation from tour guides. In the tour, they let you operate some machines used for digging coal mines. 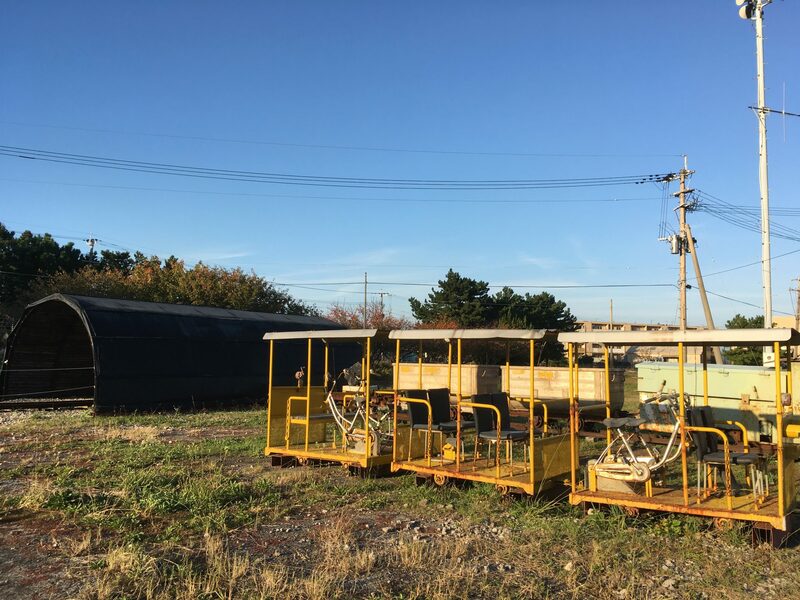 This one is a tram, but it’s not used anymore. The island is not that big, so you can circle the island on foot with about an hour-walk. 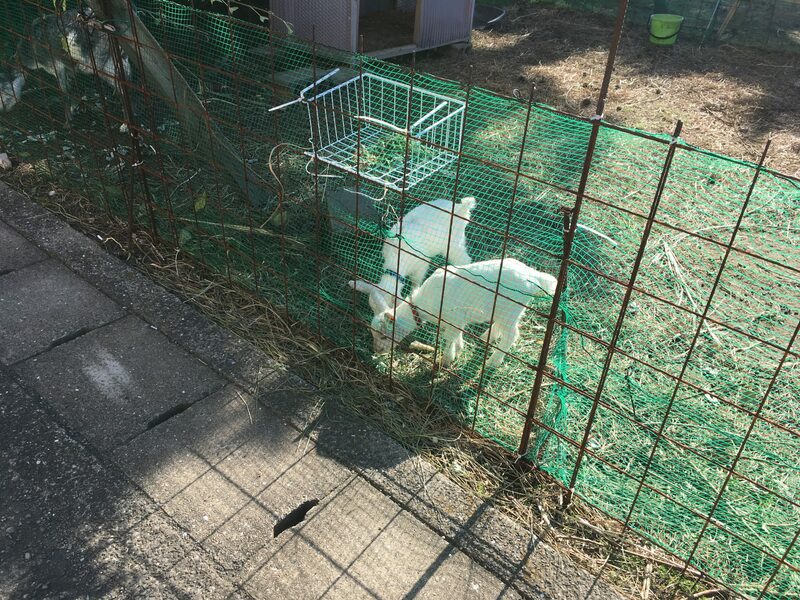 You can see cute goats below. On the way back to Nagasaki city, you can see this beautiful sunset. 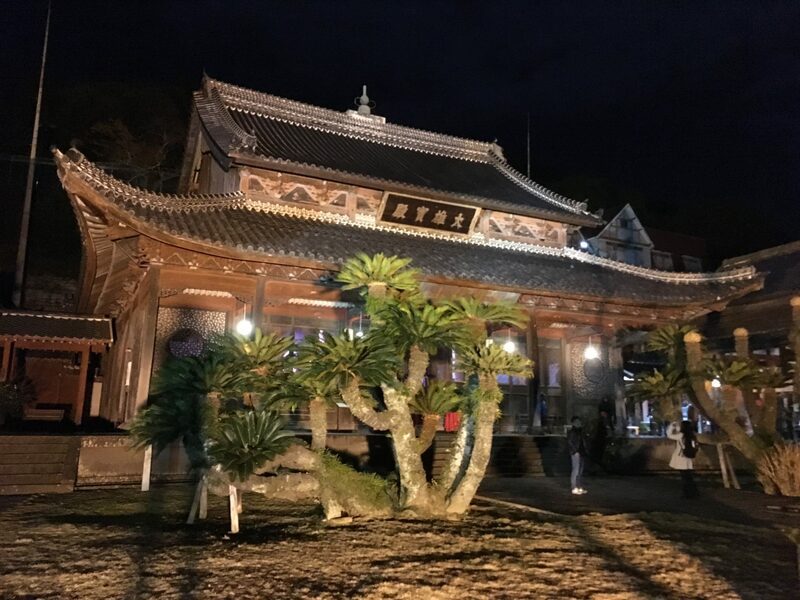 This observatory is located Sotome. All the places above are a bit hard to access without a car. 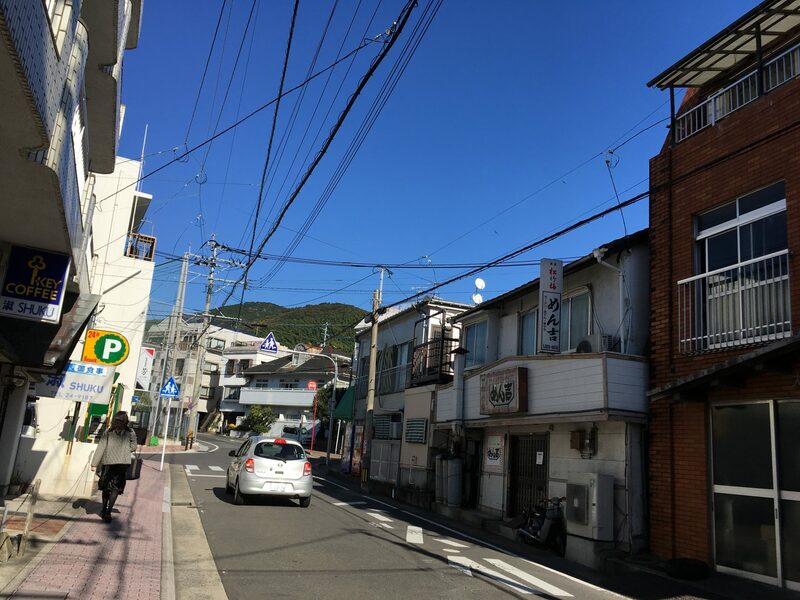 But if you have a chance to be in Nagasaki with a car and haven’t decided where to go or want to go somewhere interesting, this island is one of your options. 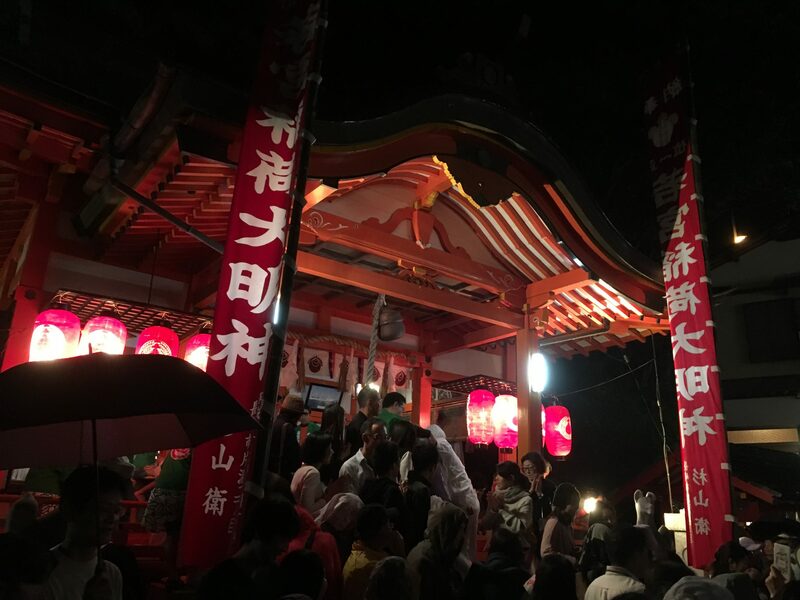 It was held in Wakamiya Inari Shrine and the festival is called „Takengei“. 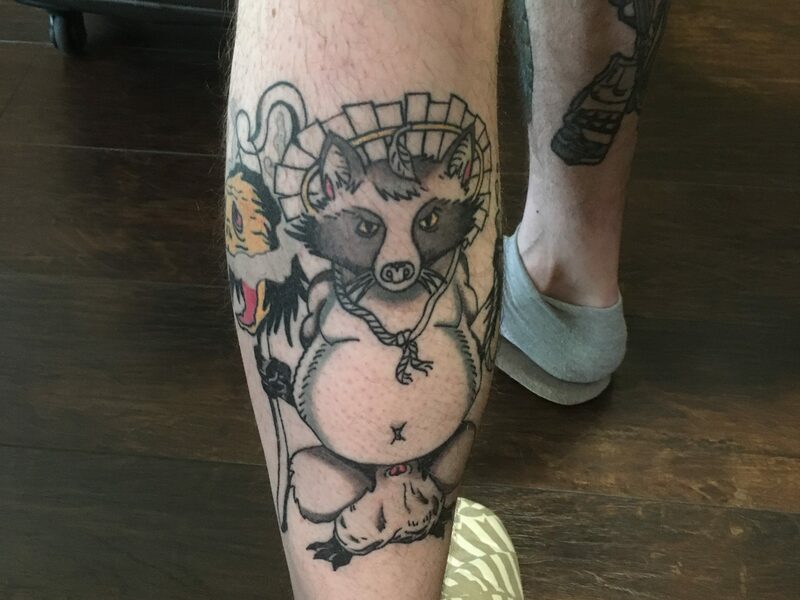 This is a tattoo of a famous ghibli movie called „Ponpoko“. He has to put colors in it. Wow, we are sure it’s going to turn out to be an awesome one!